本发明涉及用于检测介质例如液体中分析物的存在或浓度的指示剂分子，以及实现这种检测的方法。 The present invention relates to the presence or concentration of an analyte in a liquid indicator molecule, and a method for detecting the detection medium to achieve this for example. 更具体地说，本发明涉及含有相对疏水的指示剂组分单体、和亲水性单体的共聚物大分子，结果使得大分子能够在水环境中应用。 More particularly, the present invention relates to an indicator component containing relatively hydrophobic monomers, hydrophilic monomers and copolymers of macromolecules with the result that large molecules can be applied in an aqueous environment. [0001 ] 本申请是申请日为2001年8月3日、发明名称为“水环境中分析物的检测”的中国专利申请No. 01813855.1 (PCT/US01/24294国际申请进入中国国家阶段）的分案申请。 Min  This application is filed August 3, 2001, entitled "Environmental Water analyte," the Chinese patent application No. 01813855.1 (PCT / US01 / 24294 international applications entering China's national phase) of case application. 本发明涉及用于检测介质例如液体中分析物存在或浓度的指示剂分子，以及用于实现这种检测的方法。  The present invention relates to a liquid medium detecting the presence or concentration of an analyte indicator molecules, for example, and a method for realizing such detection. 更具体地说，本发明涉及含有相对疏水的指示剂组分单体和亲水性单体的共聚物大分子，结果使得大分子能够在水环境中应用。 More particularly, the present invention relates to macromolecular indicator component copolymer containing relatively hydrophobic monomers and hydrophilic monomers, with the result that the macromolecule can be applied in an aqueous environment. 用于检测介质中分析物存在或浓度的指示剂分子是公知的。 Indicator molecules  The medium used to detect the presence or concentration of an analyte are well known. 不幸地是，其中的许多在水中是不可溶或极少可溶。 Unfortunately, many of which are insoluble in water and soluble or minimal. 举例说明，美国专利5，503，770(James等）描述了一种含有荧光硼酸的化合物，当结合到糖类例如葡萄糖上时发射出高强度的荧光。 Illustration, U.S. Patent No. 5,503,770 (James et al) describes a fluorescent boronic acid containing compound, when bound to sugars such as fluorescence emission intensity at the high glucose. 荧光化合物的分子结构含有荧光团、至少一个苯基硼酸部分和至少一个提供氮原子的胺，其中氮原子邻近苯基硼酸部分以使之与硼酸发生分子内的相互作用。 The molecular structure of the fluorescent compound comprising a fluorophore, at least one phenylboronic acid moiety and at least one amine-providing nitrogen atom where the nitrogen atom adjacent to a phenyl boronic acid moiety to allow the intramolecular interactions occur with boric acid. 结果，当结合到糖类上时，这种相互作用使化合物发射荧光。 As a result, when bound to a saccharide, this interaction of the compound to emit fluorescence. 还可以参见T. James，等J. Am. Chem. Soc. 117(35) =8982-87(1995)。 See also T. James, et J. Am. Chem. Soc. 117 (35) = 8982-87 (1995). 然而，在美国专利5，503，770的实施例2中描述的化合物（具有结构式6)，实质上是不溶于水的，并且作为实际情况是，为了在液体环境中工作，需要有机溶剂例如甲醇。 However, the compounds described in U.S. Patent No. 5,503,770 of Example 2 (having the structural formula 6), substantially water-insoluble, and as a practical case, in order to work in a liquid environment, require organic solvent such as methanol . 当应用于水环境例如体内应用时，缺乏充分的水溶性将成为严重的问题。  When used in water environment such as in vivo applications, the lack of adequate water solubility will become a serious problem. 因此，存在着很大的需求使不可溶或极少可溶的指示剂适应用在水环境中。 Accordingly, there is a great need for the indicator to insoluble or little soluble in an aqueous environment with adaptation. 结果使得大分子能够检测水环境中所述分析物的存在或浓度。  The results that can detect the presence or concentration of macromolecules aqueous environment of the analyte. 结果使得所得大分子能够检测水环境中所述分析物的存在或浓度。  Results obtained that can detect the presence or concentration of macromolecules aqueous environment of the analyte. b)测试所述可检测出的特性的任何变化，由此确定所述分析物在所述样品中的存在或浓度。  b) any change in the test property may be detected, thereby determining the presence or concentration of said analyte in said sample. 结果使得所得大分子表现出所述的激发物作用。  The results showed that the resulting macromonomer according excimer action. 图1-2本发明实施例2中所述的几种指示剂大分子的放射谱图。 Radiation spectra of several indicator macromolecules in the embodiment of Example 2  FIG. 1-2 of the present invention. 图3描述了实施例3中提到的指示剂组分单体的合成。  Figure 3 describes the synthesis of an indicator constituent monomers mentioned in Example 3 of the embodiment. 图4说明了实施例5中描述的指不剂的规一化突光发射（427nm处的I/IQ)。  FIG. 4 illustrates the embodiment described in Example 5 projecting means not normalized agent light emission (at 427 nm I / IQ). 图5说明了实施例6中描述的指不剂的规一化突光发射（428nm处的I/IQ)。  FIG 5 illustrates an embodiment of the projection 6 refers to the normalized light emission not agent (at 428 nm I / IQ) as described. 图6说明了实施例6中描述的指不剂的规一化突光发射（427nm处的1/%)。  FIG. 6 illustrates an embodiment of the projection 6 refers to the normalized light emitting agent does not (1 /% 427nm at) described herein. 图7说明了实施例7中描述的指示剂的吸收谱图。  Figure 7 illustrates the absorption spectrum of the indicator described in Example 7. 一方面，本发明提供了一种在水环境中利用指示剂组分的方式，这些指示剂组分本身在水环境中是不可溶或极少可溶。  In one aspect, the present invention provides a way to use the indicator component in an aqueous environment, these indicator components in an aqueous environment itself is insoluble or little soluble. 实际上，这些指示剂是与一种或多种单体共聚的，所述单体的亲水性高到足以使所得指示剂大分子整个亲水性高到足以克服指示剂组分单体的疏水贡献。 In fact, these indicators with one or more copolymerizable monomers, the hydrophilic monomer is high enough so that the entire indicator macromolecules resulting high enough to overcome the hydrophilic monomer component indicator hydrophobic contribution. 合适的指示剂组分包括在水中不可溶或极少可溶并且其分析物至少极少可溶解在水中的指示剂分子。  Suitable indicator components include insoluble or little soluble in water and which is at least very little analyte indicator molecules dissolved in water. 合适的分析物包括葡萄糖、果糖和其它邻位二醇；α -羟基酸；β -酮酸；氧；二氧化碳；多种离子例如锌、钾、氢（pH值测试）、碳酸根；毒素；无机物；激素等。 Suitable analytes include glucose, fructose, and other vicinal diols; α - hydroxy acids; β - keto acid; oxygen; carbon dioxide; more ions such as zinc, potassium, hydrogen (pH value of the test), a carbonate; toxins; Inorganic thereof; hormones. 应该意识到，本文中所用的指示剂组分单体的范围包括两种或多种单个单体（至少一种单体不足以可溶到在水环境中足够地作用）的混合物，所述单体当结合到本发明的大分子中时，起指示剂的作用。 It should be appreciated that the scope of the indicator component monomer as used herein, include two or more individual monomers (at least one monomer not sufficient enough to act soluble in an aqueous environment) of a mixture of said single when bound to a macromolecular material according to the present invention, it acts as an indicator. 其中的多种指示剂组分是公知的。  wherein the plurality of components of the indicator are known. 举例说明，美国专利5，503，770中所描述的化合物在检测糖类例如葡萄糖是有用的，但是它极少可溶直至不溶于水。 Illustration, the compound described in U.S. Patent No. 5,503,770, for example, as glucose sugars are useful in the detection, but it is insoluble in water until little soluble. 另一类指示剂包括1999年3月11日申请的未审美国申请09/265，979 (并且与1999年9月16日以PCT国际申请的形式公开为W099/46600，该文献被引用在本文中作参考）中描述的镧系元素螯合物；多芳香烃和它们的衍生物；2001年I月5日申请的未审申请08/754，217和2001年2月21日提出的未审申请60/269，887中公开的指示剂，这两篇文献都描述了具有两个识别元素的指示剂，所述的识别元素能够在葡萄糖和葡萄糖之间区别并且干扰α-羟基酸或β-二酮等。 The other indicators including applications March 11, 1999 unexamined US Application No. 09 / 265,979 (with 1999 and September 16 in the form of PCT International Application published as W099 / 46600, which is hereby incorporated herein in reference) lanthanide chelate is described; polyaromatic hydrocarbons and their derivatives; Unexamined application Laid-08 / 754,217 and 21 February 2001, submitted May 5, 2001 filed the I application 60 / 269,887 discloses the indicator, both of which describe the indicator having two recognition elements, said identification element capable of interfering α- and β- hydroxy acid or the difference between glucose and dione. 当将大分子暴露于要检测的分析物中时，本发明的指示剂组分一般具有依赖于浓度方式变化的可检测出的特性。  When the macromolecule is exposed to the analyte to be detected, the indicator component of the present invention generally has a characteristic dependent on the manner of varying concentrations detectable. 其中多种这样的特性是公知的，并可以用于本发明。 Wherein the plurality of such properties are well known and may be used in the present invention. 举例说明，指示剂可以包括一发光（荧光或磷光）或化学发光部分，一吸光部分等。 Way of example, the indicator may include a luminescent (fluorescent or phosphorescent) or chemiluminescent moiety, a light-absorbing portion and the like. 指示剂可以包括一能量给体部分和一能量受体部分，彼此间隔以使之当大分子与分析物相互作用时具有可检测得出的变化。 Indicator may include an energy donor moiety and an energy acceptor moiety, spaced from each other such that when the molecules interact with the analyte having detectable changes obtained. 指示剂可以包括一荧光团和一猝灭剂，构型为使当不含有分析物时荧光团被猝灭剂猝灭。 Indicator may comprise a fluorophore and a quencher, configuration is such that when the analyte does not contain a fluorophore is quenched by the quencher. 此时，当存在分析物时，指示剂发生了构型变化，这种变化引起猝灭剂充分远离荧光团，由此发出荧光。 At this time, when the analyte is present, an indicator of the occurrence of conformational changes, this change causes the fluorophore away from a quencher sufficiently, thereby emitting fluorescence. 相反，荧光团和猝灭剂可以构型为，当不存在分析物时，它们充分远离并且荧光团发出荧`光；当与分析物相互作用时，荧光团和猝灭剂充分移近来产生猝灭。 Conversely, the fluorophore and quencher may be configured as a type, when the analyte is not present, and they are sufficiently far from the fluorophore emits fluorescence light `; when interacting with an analyte, a fluorophore and quencher move closer to generate sufficient burst off. 构型变化的概念更详细地描述在2001年I月5日申请的未审申请09/754，219中，其标题为“分析物的检测”，该文献被引用在本文中作参考。 Conformational change concept is described in more detail in 5 January 2001 I Unexamined Application No. 09 / 754,219, which is entitled "detecting an analyte", which is hereby incorporated by reference herein. 其它可检测地出的部分包括其荧光受分析物相互作用的影响的那些，所述相互作用是通过电子诱导的电子转移或诱导作用。  Other detectable fluorescence which comprises partially affected by the analyte interaction of those, said interaction is induced by electron transfer or electron induced. 这些指示剂包括1999年3月11日申请的未审美国申请09/265，979 (并且与1999年9月16日以PCT国际申请的形式公开为W099/46600，该文献被引用在本文中作参考）中描述的镧系元素螯合物；多芳香烃和它们的衍生物；香豆素；BODIPY® (Molecular Probes, Eugene, OR);丹酰；儿茶酹等。 These indicators include March 11, 1999 filed Unexamined US Application No. 09 / 265,979 (with 1999 and September 16 in the form of PCT International Application published as W099 / 46600, which is hereby incorporated by herein lanthanide chelate by reference) as described; polyaromatic hydrocarbons and their derivatives; coumarin; BODIPY® (Molecular Probes, Eugene, OR); dansyl; catechu sprinkle the like. 这部分的另一类包括当指示剂化合物与分析物相互作用时其吸收谱图变化的那些，包括茜素红等。 Another part of this includes when the indicator compound interacts with the analyte to those which include alizarin red absorption spectrum changes, and the like. 这部分的另一类包括通过近接效应调节其荧光的那些，例如能量给体/受体对例如丹酰/dabsyl等。 Another portion of this fluorescence which comprises adjusting the proximity effect by those, for example, energy donor / acceptor pair e.g. dansyl / Dabsyl like. 优选的是，可检测出的特性是可检测地出的光或谱图变化，例如吸收特征的变化(例如吸收性和/或谱移）、荧光衰变时间（通过时域或频域测试来确定的）、荧光强度、荧光各向异性或极化中的变化；放射谱图的谱移；时间分辨各向异性衰变中的变化（通过时域或频域测试来确定的）等。  Preferably, the detectable characteristic is to be detected or a light spectrum change, such as changes in the absorption characteristics (e.g., the absorbent and / or spectral shift), fluorescence decay time (by time domain or frequency domain testing determined), the fluorescence intensity, fluorescence anisotropy or polarization change; the radiation spectra of spectral shift; change in time-resolved anisotropy decays (determined) by time domain or frequency domain testing. 合适的亲水性单体应当充分亲水以克服疏水性指示剂组分单体的总和，以使所得指示剂大分子能够在水环境中作用。  Suitable hydrophilic monomers should be sufficient to overcome the sum of the hydrophilic indicator hydrophobic monomer component, so can act in an aqueous environment resulting indicator macromolecules. 易于理解的是，很大量的亲水性单体适用于本发明。 Readily appreciated that the very large number of hydrophilic monomers suitable for use in the present invention. 举例说明，合适的亲水性单体包括甲基丙烯酰胺、甲基丙烯酸酯、甲基丙烯酸、二甲基丙烯酰胺、TMAMA、乙烯基类、多糖类、聚酰胺、多氨基酸、亲水性硅烷或硅氧烷等，以及两种或多种不同单体的混合物。 Way of example, suitable hydrophilic monomers include acrylamide, methacrylate, methacrylic acid, dimethyl acrylamide, TMAMA, vinyls, polysaccharides, polyamides, polyamino acids, hydrophilic , and mixtures of two or more different monomers other silanes or siloxanes. 对于设定应用的合适亲水性单体将根据多个参数进行变化，包括打算的操作温度、盐度、pH、其它溶质的存在和种类、离子强度等。  will vary depending on the parameters for setting a plurality of hydrophilic monomers suitable application, including the intended operating temperature, salinity, pH, and the presence of other solutes type, ionic strength. 很容易理解，指示剂大分子的亲水性程度可以通过添加其它的官能化组分例如离子（例如磺酸盐、季胺、羧基等）、极性部分（例如羟基、巯基、胺、羰基、酰胺等）、卤素等来增加。 Be readily appreciated, the degree of hydrophilicity indicator macromolecules may be functionalized by the addition of other components such as ions (e.g. salt, quaternary amine, carboxyl, etc. ), a polar moiety (e.g. a hydroxyl group, a mercapto group, an amine, a carbonyl group, amides, etc. ), a halogen or the like increases. 应该意识到，亲水性单体与指示剂组分单体的摩尔比可以根据所需要的特定用途而大幅度变化。  It should be appreciated, may vary widely with molar ratio of the hydrophilic monomer component monomers indicator according to the particular desired use. 亲水性单体与指示剂组分单体的优选摩尔比大约为2 ： 1-1000 ： 1，更优选大约5 ： 1-50 ：1。 The molar ratio of the hydrophilic monomer with the indicator component monomers is about 2: 1 to 1000: 1, more preferably from about 5: 1-50: 1. 本发明的指示剂大分子一般可以通过至少一种指示剂组分单体和至少一种亲水性单体的简单共聚来合成。  The present invention generally indicator macromolecules can be synthesized by copolymerizing at least one indicator component simple monomer and at least one hydrophilic monomer. 最佳的聚合条件（时间、温度、催化剂等）可以根据具体反应物和最终产物的用途来改变，并且能够由本领域普通技术人员简单地完成。 Optimal polymerization conditions (time, temperature, catalyst, etc.) may be changed according to the use of the particular reactants and final products, and can be easily accomplished by one of ordinary skill in the art. 应该认识到，本发明的指示剂大分子可以具有任何所需要的水溶解性。  It should be appreciated, the indicator molecules of the present invention may have any desired water solubility. 举例说明，下面实施例1和2的指示剂大分子非常可溶，易于溶解在水溶液中。 Illustration, Example 2, and very soluble macromolecular indicator Embodiment 1 Hereinafter, easily dissolved in an aqueous solution. 另一方面，举例说明，含有亲水性单体HEMA(甲基丙烯酸羟乙基酯）或其它常规水凝胶成分的指示剂大分子可能是不可溶的，但却是亲水的。 On the other hand, it illustrates, containing a hydrophilic monomer of HEMA (hydroxyethyl methacrylate) or other indicator macromolecules conventional hydrogel ingredients may be insoluble, but is hydrophilic. [0051 ] 可溶指示剂大分子可以直接应用于水中，如果希望是这样的话。  indicator macromolecules soluble in water can be directly applied, if so is desired. 另一方面，如果所需要的用途是这样要求的，那么指示剂大分子可以固定（例如通过外力包埋、共价或离子结合或其它方法）在不溶表面或基质（例如玻璃、塑料、聚合物等）内部。 On the other hand, if the desired use is required, then the indicator macromolecules may be fixed (e.g., embedded by an external force, covalent or ionic bonding or other methods) the insoluble matrix or surface (e.g. glass, plastic, polymer etc.) inside. 例如，当指示剂大分子包埋在另一种聚合物内部，该包埋指示剂大分子的物质优选对分析物来说充分可渗透，使分析物和大分子中的指示剂组分之间发生适当的相互作用。 For example, when the indicator between macromolecules embedded in a further inside the polymer, the macromolecular indicator embedded material is preferably sufficiently permeable to the analyte, analyte and indicator component macromolecules appropriate interaction. 本发明的指示剂大分子存在许多应用，包括在能源、医药和农业领域用作指示剂。  The indicator macromolecules present invention in many applications, including use as an indicator of energy, medicine and agriculture. 例如，指示剂大分子能够用作用于检测血液、组织、尿等中的次级或上级葡萄糖的指示剂分子，由此为诊断或跟踪例如糖尿病和肾上腺机能不全这样的疾病提供有价值的信息。 For example, the indicator can be used for detecting macromolecules in blood, tissue, urine or the like superior in secondary indicator molecule glucose, diabetes, and adrenal insufficiency whereby such disease provides valuable information for the diagnosis or tracking example. 用于人体治疗用途的葡萄糖的医药制备需要跟踪和控制。 Glucose for the preparation of human pharmaceutical therapeutic use tracking and control needs. 本发明在农药中的应用包括检测分析物例如葡萄糖在大豆和其它农作物中的含量。  The application of the pesticide in the present invention include, for example, the content of an analyte detecting glucose in soybeans and other crops. 对于这种高价值的产品例如葡萄酒的关键农作物的判定中，必需认真跟踪葡萄糖。 For such high-value products such as wine determination key crops, it is necessary to seriously track glucose. 由于葡萄糖是发酵工艺中最昂贵的碳源和原料，因此在动力酒精（power alcohol)的制备中，为了优化反应器的加料速率，葡萄糖的跟踪是关键的。 Since glucose is the most expensive carbon source process and fermentation of raw materials, and therefore in the preparation of alcohol power (power alcohol), in order to optimize the feed rate of the reactor, glucose track is critical. 在制备饮料和发酵饮料的过程中，葡萄糖浓度的反应器混合和控制对于质量控制来说也是关键的，国际上，这些饮料消耗了最大量的葡萄糖和可发酵糖。 In the process of preparing a beverage and fermented beverages, reactor mixing and control of glucose concentration also is critical to quality control, and international, which consumes the maximum amount of beverage glucose and fermentable sugars. 当指示剂大分子结合了荧光指示剂取代物时，现有技术中也已经知道能够利用本发明大分子的多种检测技术。  When the indicator when the macromolecule binding fluorescent indicator substituents, also known to the prior art, various detection techniques can be macromolecules present invention. 例如，本发明的大分子能够用在荧光传感元件中（例如，美国专利5，517，313)，或者可以结合到聚合物或其它基质例如用于视觉测试的测试纸。 For example, molecules of the present invention can be used in fluorescent sensing element (e.g., U.S. Patent No. 5,517,313), or can be incorporated into the polymer or other substrate, for example, a test paper for visual testing. 例如，后一种技术将用于，例如以与用石蕊试纸条测试PH值类似的方法用于葡萄糖测试。 For example, the technique will be used, for example with a strip of litmus test PH value similar methods for a glucose test. 本文中描述的大分子也可以用作使用标准长桌面分析设备例如Shimadzu, Hi tachi, Jasco,Backman和其它公司制备的分光突光计或临床分析议的简单试剂。 Molecules described herein may be used as long the desktop using standard analysis apparatus prepared e.g. Shimadzu, Hi tachi, Jasco, Backman and others simple projection optical measurement reagent spectrophotometric analysis of clinical or proposed. 这些分子还为例如OceanOptics (Dunedin, Floride)或Oriel Optics制备的光纤基传感器和分析突光计提供分析物具体的化学/光信号转导。 These molecules also e.g. OceanOptics (Dunedin, Floride) fiber optic based sensor and analyzing the light projection count prepared Oriel Optics provide analyte specific chemical / optical signal transduction or as. 美国专利5，517，313 (其说明书被应用在本文中作参考)描述了一种荧光传感设备，其中，本发明的大分子能够用于确定液体介质中分析物例如葡萄糖或其它顺式二醇化合物的存在或浓度。  U.S. Patent No. 5,517,313 (which is used in the specification herein by reference) describes a fluorescence sensing device, wherein the macromolecule according to the present invention can be used to determine an analyte in a liquid medium such as glucose or other the presence or concentration of the cis-diol compound. 该传感设备包括含有荧光指示剂分子的基质（后文中“荧光基质”）、高通量滤波器和光检测器的多层组合。 The sensing apparatus comprises a fluorescent indicator molecule-containing matrix (hereafter "fluorescent matrix"), a combination of high-throughput multi-layer filter and the light detector. 该设备中，光源，优选发光二极管（“LED“），至少部分位于指示剂材料内，或者位于其上放置指示剂介质的波导管中，因此，来自光源的入射光使指示剂分子发出荧光。 In the apparatus, a light source, preferably a light emitting diode ( "LED"), at least partially within the indicator material, or in which the indicator is placed on a dielectric waveguide, and therefore, the incident light from the light source causes the indicator molecules to fluoresce. 高通量滤波器使发射光接触光检测器，通过过滤掉来自光源的散射入射光。 High-throughput filter passes the emitted light contacts the light detector, by filtering out scattered incident light from the light source. 美国专利5，517，313中描述的设备中使用的指示剂分子的荧光是通过分析物例如葡萄糖或其它顺式二醇化合物的局部存在而调节例如衰弱或增强。  U.S. Patent No. 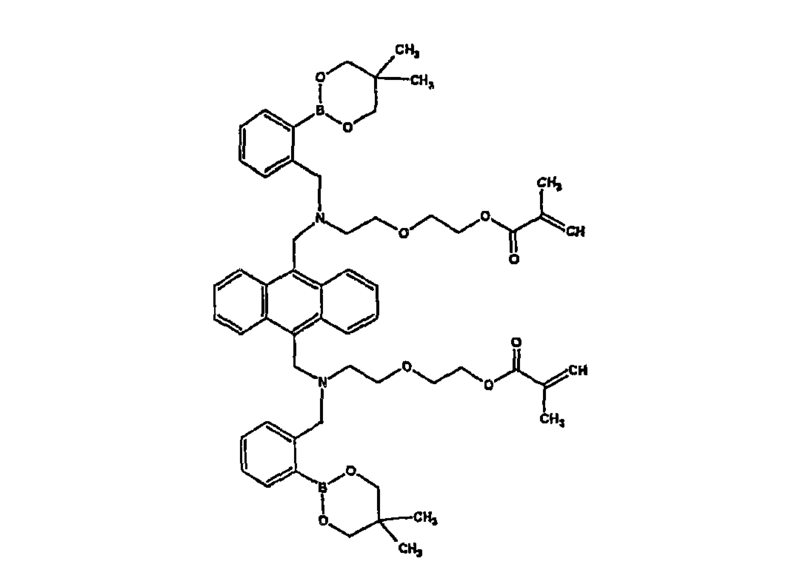 5,517,313 fluorescent indicator molecules used in the device described is a fragmentary glucose or other cis-diol compound, for example, by the presence of the analyte, for example, adjusting the weakened or enhanced. 在美国专利5，517，313中描述的传感器中，含有指示剂分子的物质可透过分析物。  In the sensor described in U.S. Patent No. 5,517,313, the indicator molecule-containing material permeable to the analyte. 因此，分析物可以从外围测试介质扩散到该物质中，因此影响指示剂分子发射的荧光。 Thus, the analyte can diffuse into the test medium from the periphery of the material, thereby affecting the fluorescence emitted by the indicator molecules. 光源、含有指示剂分子材料、高通量滤波器和光检测器可以排列为，使指示剂分子发射的至少一部分荧光影响光检测器，产生电子信号，该信号指示了外围介质中的分析物的浓度(例如葡萄糖）。 The light source, indicator molecule-containing material, high-throughput filter and a photodetector may be arranged in the indicator molecules affect the fluorescence emitted at least a portion of light detector generates an electrical signal, which indicates the concentration of an analyte in a medium, the peripheral (eg, glucose). 根据利用本发明指示剂大分子的其它可能的实施方式，传感器还公开在美国专利5，910，661，5，917，605和5，894，351中，所有这些文献都引用在本文中作参考。  According to other possible embodiments of the present invention using the indicator macromolecules, sensor further disclosed in U.S. Patent No. 5,910,661,5,917,605 and 5,894,351, all of which are incorporated herein in reference. 本发明的大分子还可以用在可植入的设备，例如用来连续跟踪体内的分析物（例如血液或组织葡萄糖含量） 。  macromolecules present invention may also be used in an implantable device, for example, a continuous track body analyte (e.g. glucose content in blood or tissue). 合适的设备公开在，例如1999年8月26日提交的未审美国申请09/383，148，以及美国专利5，833，603,6, 002，954和6，011，984中，所有这些文献都引用在本文中作参考。 Suitable apparatus disclosed in, for example, Unexamined 1999 August 26 filed US Application 09 / 383,148, and US Patent 5,833,603,6, 002,954 and 6,011,984, all of these documents We are incorporated by reference herein. 本发明的大分子具有独特的优点。  macromolecules present invention has unique advantages. 例如，样品的吸光率直接与吸收物的浓度和样品的路径长度成正比。 For example, the sample absorbance is directly proportional to the concentration and the absorption path length of the sample material. 因此，在基于吸光率的分析中，很明显，对于给定的吸光率来说，如果吸收物浓度大大增加，那么样品的路径长度就大大减小。 Thus, the analysis based on the absorbance, it is clear that, for a given light absorption, if the absorbent concentration increased significantly, then the path length of the sample is greatly reduced. 令人想望的浓度增加可以通过降低亲水性单体与指示剂组分单体的比例来实现。 Desirably increased concentration may be achieved by reducing the proportion of the hydrophilic monomer in the monomer component with the indicator. 事实上，本发明允许更多的吸收物组分的局部浓度进入有限的空间，由此增加单位厚度的吸光率。 Indeed, the present invention allows the local concentration of more absorbent components into the limited space, thereby increasing the thickness of the light absorption units. 因此当进行基于吸光率的分析时，本发明额外地允许使用更小的设备。 Thus when performing the analysis based on the light absorption rate, the present invention additionally allows the use of smaller equipment. 还显然的是，对于任何基于光的分析包括基于荧光的分析来说，大大增加指示剂组分的局部浓度的能力产生了若干优点。 It is also clear that for any light-based assays include fluorescence analysis is based on the ability to greatly increase the local concentration of the indicator component produces several advantages. 例如，指示剂组分的局部浓度更高，能够允许使用更薄的指示剂大分子层，这反过来大大降低了大分子对分析物存在或浓度的响应时间。 For example, a higher local concentration of the indicator components, can allow the use of thinner layers of the indicator molecules, which in turn greatly reduces the response time of the molecules or the presence of the analyte concentration. 此外，能够造成激发光的更高消光，这当在组织体系或生理溶液中工作时能够有利地降低自动荧光的入射。 In addition, higher can cause the extinction of the excitation light, it is possible to advantageously reduce autofluorescence incident system when operating in a tissue or physiological solution. 例如，当利用基于荧光的大分子工作时，不吸收的激发光能够与例如存在于组织或生理溶液中的NADH、色氨酸、酪氨酸等相互作用，产生来自这些部分的不利的干扰荧光发射。 For example, when the work using a fluorescence-based macromolecule, unabsorbed excitation light capable of interacting with e.g. NADH present in a tissue or a physiological solution, tryptophan, tyrosine, etc., adversely interfering fluorescence from these portions emission. 高吸光性指示剂组分的局部浓度高，可以降低这种不理想的干扰发射。 High local concentration of the high light-absorbing indicator components, can reduce this undesirable interference emission. 另外，当在组织或生理溶液中使用基于吸光性的大分子时，有利的是降低辐射源的含量，这反映在潜在改变外围组织或液体中组分的含量例如胆红素。 Further, when used in a tissue or a physiological solution when a light-absorbing macromolecular-based, it is advantageous to reduce the content of the radiation source, which is reflected in the potential to change the content of the component of the peripheral tissues or fluids for example bilirubin. 因此，高吸光性指示剂分子的局部浓度高，能够降低这种不利影响。 Thus, high local concentration of the high light-absorbing indicator molecules, such adverse effects can be reduced. 作为本发明的另一方面，已经发现，某些大分子存在激发物作用。  As another aspect of the present invention, it has been found that there is some effect excimer molecules. 作为背景技术，当带有芳香结构的两个平面分子（例如经常带有荧光团）交会在一点时，在此点上，它们的Pi电子轨道叶重叠，然后，对于某些分子来说能够产生共振条件，其中来自重叠的共振产生杂化结构，这种结构是能量上最有利且稳定的。 By way of background, when molecules with two planar aromatic structure (e.g., often with a fluorophore) at the intersection point, at this point, Pi electron orbit thereof leaf overlap, then it is possible for some molecules to produce resonance condition, wherein the overlapping resonances produced from hybrid structure which is the most favorable and stable energy. 这两个平面分子在共平面构型中取向，象三明治上的两个面包片，它们的电子云在它们之间重叠。 These two molecules in a plane oriented in a coplanar configuration, such as two slices of bread on a sandwich, electron clouds thereof overlap between them. 对于荧光平面物种来说，相对于未偶合物种，特征低磁场发射发生在比母物种远远更低能量的波长处。 For flat fluorescent species, the species relative to non-coupling, wherein the low magnetic field emission occurs at wavelengths than the parent species is much lower energy. 能够形成这种有利共振构型的分子被公知作为激发物。 This is advantageously possible to form a resonant configuration molecule is known as an excimer. 正如本文中所用的那样，激发物作用是指来自激发物的比特征波长更长波长处的发射。 As used herein, as is the ratio of excimer action was characterized from the excitation wavelength emission at a longer wavelength. 5 ： I的比例下突然出现绿色发射之外，所有的蒽衍生物都在417nm处具有特征蓝色发射。 5: Comparative Example I under the green emission than sudden, all the anthracene derivative has a characteristic blue emission at 417nm. 这种绿色发射是激发物杂化物的发射，并且发射向低磁场位移大约100+nm(〜515-570nm，绿色）。 This emission was green emission is a hybrid of the excitation and emission to the downfield shift of about 100 + nm (~515-570nm, green). 由于通过沿着聚合物骨架放置而不是三维空间内的可溶浓缩物的方式控制了平面物种之间的距离，因此整个溶液的浓度不需要高。 Since by placing along the polymer backbone and the way the soluble concentrate is not within the control of the three-dimensional space distance between the plane species, and so does not require a high concentration throughout the solution. 令人惊奇地是发现，激发物发射区对分析物浓度变化无感应，但是对分析体系的所有其它方面例如激发强度、温度和PH值有感应。  Surprisingly, it was found that an excimer emitter analyte concentration changes non-inductive, but e.g. excitation intensity, temperature and PH induction for all other aspects of the assay system. 因此，本发明的指示剂大分子既作为指示剂，也作为内部参照物。 Accordingly, both the indicator molecules of the present invention as an indicator, but also as an internal reference. 例如，理想的参考方案是，其中指示剂波长处（即受分析物影响的波长）的发射强度利用带通滤波器的选择被激发物波长处的发射强度进行光学上的均分。 For example, the reference solution is desirable, wherein the indicator wavelength (i.e., the wavelength affected by the analyte) the intensity of emission bandpass filter is selected at the excitation wavelength of the emission intensity on the average was optically. 所得数值作干扰系数（它影响发射荧光的性能例如被例如氧猝灭的荧光、PH值的漂移和误差）、动力系数和影响LED强度的漂移、室温变化等方面的校正。 The resulting value for the interference factor (which affects the performance of the fluorescence emitted by, for example, for example, oxygen quencher fluorescence, PH value and the error drift) correction terms, the drift force coefficient and affect the LED intensity, temperature changes. 容易认识到，具有激发物作用的本发明大分子既可以用于水环境也可以用于非水环境。  readily appreciated, a macromolecule having the excimer effect of the present invention may be used in aqueous environments may also be used a non-aqueous environment. 因此，根据所需要的用途，这些大分子以及组分单体（形成激发物和其它单体）可以为亲水性至疏水性。 Thus, according to the desired use, these macromolecules as well as the monomer component (formation of excimer and other monomers) may be hydrophilic to hydrophobic. 还有，当本发明的激发物大分子被用于检测分析物的存在或浓度时，该大分子可以直接用于溶液中，或者可以按照上述方法固定。  Also, when excimer molecules of the present invention is used for detecting the presence or concentration of an analyte, the macromolecule can be directly used in solution, or may be fixed according to the method described above. 本发明的大分子能够由本领域技术人员，在不需要过度试验的情况下，利用已知的反应机理和反应物来制备，所述反应机理和反应物包括与下面常规方法一致的反应机理。  The present invention can be macromolecules by those skilled in the art, without the need for undue experimentation, be prepared using known reaction mechanisms and reagents, and the reaction mechanism is consistent with the following reactants include conventional reaction methods mechanism. 向在冰水浴中搅拌的氯仿（250mL)中的N_(3_氨丙基）甲基丙烯酰胺氯化氢(Polysciences, #21200) (11. 82g,0. 066mole,3. Oeq)和痕量阻聚剂DBMP (2，6-二叔丁基-4-甲基苯酹）(IOmg)的悬浮液中，20分钟内滴加二异丙基乙胺（25mL. , 18. 55g,O. 144mole，6. 5eq)。  To a stirred solution of chloroform in an ice water bath N_ (250mL) of (3_ aminopropyl) methacrylamide chloride (Polysciences, # 21200) (11. 82g, 0. 066mole, 3. Oeq) and marks the amount of suspension polymerization inhibitor DBMP (2,6- di-t-butyl-4-methylphenyl sprinkle) (IOmg) of liquid, was added dropwise over 20 minutes diisopropylethylamine (25mL., 18. 55g, O . 144mole, 6. 5eq). 使该混合物的温度达到室温，并在此在冰水浴中冷却。 The temperature of the mixture reached room temperature, and this was cooled in an ice-water bath. I小时内，向其中滴加9-氯甲基蒽(5. Og, O. 022mole)在氯仿(IOOmL)中的澄清溶液。 Within I hour, added dropwise chloromethyl-anthracene-9- (5. Og, O. 022mole) a clear solution in chloroform (IOOmL) in. 在25°C下反应I小时，50°C下反应12小时，然后在70°C下反应2小时。 The reaction at 25 ° C I h, 12 h at 50 ° C, followed by reaction at 70 ° C 2 hours. 将该混合物用水洗涤^OmLX4)，用二氯甲烷萃取水层。  The mixture was washed ^ OmLX4), the aqueous layer extracted with dichloromethane. 将有机层混合在一起，在Na2SO4上干燥，分离并在40°C减压下除去溶剂。 The organic layers were combined together, dried over Na2SO4, and separated at 40 ° C the solvent was removed under reduced pressure. 然后，将未提纯的物质用含有2-5%甲醇的二氯甲烷色谱分离在硅胶上，得到2. 44g(33.4% )固体产物。 Dichloromethane then chromatography, the material was unpurified containing 2-5% methanol on silica gel to give 2. 44g (33.4%) solid product. TLC(硅胶）：Rf (MeOH/CH2Cl2= 1/9), 一个斑点。 TLC (silica gel): Rf (MeOH / CH2Cl2 = 1/9), one spot. 向在冰水浴中搅拌的水（30mL)与四氢呋喃（30mL)的混合物中的N-(3_氨丙基）甲基丙烯酰胺氯化氢（788mg,4. 41mmole, IOeq)和痕量阻聚剂MEHQ(甲基醚氢醌）（2mg)的澄清溶液中，I小时内加入Na2C03/NaHC03缓冲液（66mL，0. 2M，pH10)，并在3小时内，向其中滴加9-氯甲基蒽（100mg，0.441mmol e)在氯仿（IOOmL)中的溶液。  To a stirred mixture in an ice water bath and water (30mL) and tetrahydrofuran (30mL) in N- (3_ aminopropyl) methacrylamide chloride (788mg, 4. 41mmole, IOeq) and trace resistance polymerization inhibitor MEHQ (hydroquinone methyl ether) (2mg) clear solution was added Na2C03 / NaHC03 buffer (66mL, 0. 2M, pH10) within I hour and within three hours, and thereto is added dropwise chloro-9- methyl anthracene (100mg, 0.441mmol e) in chloroform (IOOmL) in. 在25°C下反应7小时，然后在55°C下反应12小时。 The reaction for 7 hours at 25 ° C, followed by reaction at 55 ° C 12 h.
 分离有机层，用水洗涤（50mLX4)，并用二氯甲烷萃取水层。  The organic layer was separated, washed with water (50mLX4), and the aqueous layer was extracted with dichloromethane. 将有机层混合在一起，在Na2SO4上干燥，分离并在45°C减压下除去溶剂。 The organic layers were combined together, dried over Na2SO4, and separated at 45 ° C the solvent was removed under reduced pressure. 然后，将未提纯的物质用含有10-20%甲醇的二氯甲烷色谱分离在硅胶上，得到28.7mg(19.6% )固体产物。 Then, the unpurified material dichloromethane containing 10-20% methanol chromatography on silica gel to give (19.6%) with a solid product 28.7mg. TLC(硅胶）：Rf(MeOH/CH2Cl2 = 3/7)，一个斑点。 TLC (silica gel): Rf (MeOH / CH2Cl2 = 3/7), one spot. 向在冰水浴中搅拌的氯仿（200mL)中的上面步骤a)中得到的产物（2. 440g，O. 00734mole)和痕量阻聚剂DBMP(IOmg)的溶液中，10分钟内分份加入DIEA(二异丙基乙胺)(2. 846g，3. 84mL， O. 022mole, 3. Oeq)，然后30分钟内向其中加入2，2- 二甲基丙烷-1,3_ 二基[邻(溴甲基)苯基]硼酸盐(2. 492g,0. 00881mole,1. 2eq)在氯仿(15mL)中的溶液。  To a stirred solution in an ice water bath chloroform (200mL) in the above step a) (2. 440g, O. 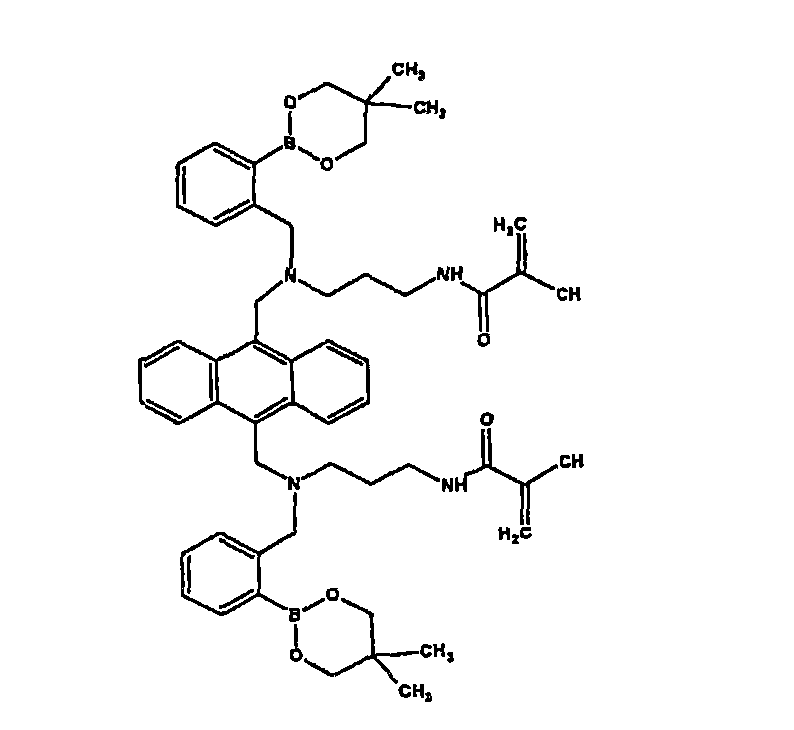 00734mole) obtained in the polymerization inhibitors and trace DBMP (IOmg) was within 10 minutes was added portionwise DIEA (diisopropylethylamine) (2. 846g, 3. 84mL, O. 022mole, 3. Oeq), was added over 30 minutes and then 2,2-dimethyl-propane-diyl -1,3_ solution [o- (bromomethyl) phenyl] borate (2. 492g, 0. 00881mole, 1. 2eq) in chloroform (15mL) in. 该反应在室温下进行20小时。 The reaction is carried out at room temperature for 20 hours. 将该混合物用水洗涤，分离并用二氯甲烷萃取水层。  The mixture was washed with water, separated and the aqueous layer was extracted with dichloromethane. 将有机层混合在一起，在Na2SO4上干燥，分离并在25°C减压下除去溶剂。 The organic layers were combined together, dried over Na2SO4, separated and the solvent removed under reduced pressure at 25 ° C for. 然后，将半固体（4. 75g)用含有2_5%甲醇的二氯甲烷色谱分离在硅胶上，得到2. 50g(76. 3% )淡黄色结晶固体的产物，mp72-73°C。 Then, the semi-solid (4. 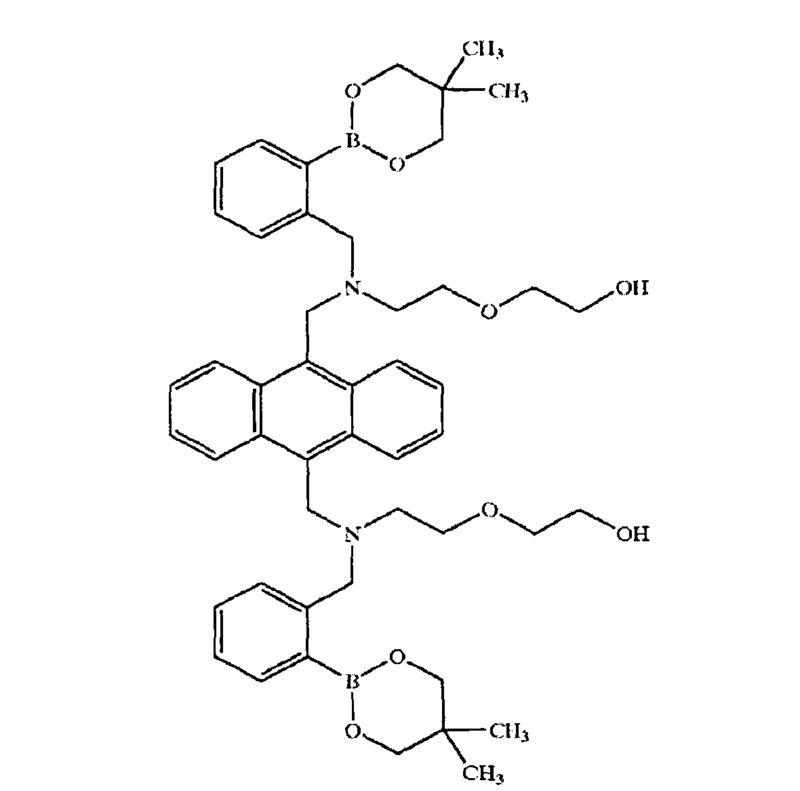 75g) containing 2_5% methanol in dichloromethane chromatography on silica gel to give 2. 50g (76. 3%) as a pale yellow crystalline solid product, mp72-73 ° C. TLC (硅胶)：Rf(MeOH/CH2Cl2 = 1/9)。 TLC (silica gel): Rf (MeOH / CH2Cl2 = 1/9). 它可溶解在CH2Cl2, CHCl3, THF，CH3OH 和C2H5OH,在H2O和醚中具有有限的溶解度。 It is soluble in CH2Cl2, CHCl3, THF, CH3OH and C2H5OH, have limited solubility in H2O and ether. (50 :1)溶液：向单体(42. 3mg,0. 0908mmol)在乙醇(100%,1. 5mL)的溶液中，加入MAPTAC[3-(甲基丙烯酰氨基）丙基]三甲基氯化铵(2. OmL,1. Og, 4. 54mmol,50eq)和作为引发剂的AIBN(偶氮二异丁腈)的乙醇溶液（O. 183M，0. 2mL)，得到一澄清溶液。  (50: 1) was added: the monomers (. 42. 3mg, 0 0908mmol) in ethanol (. 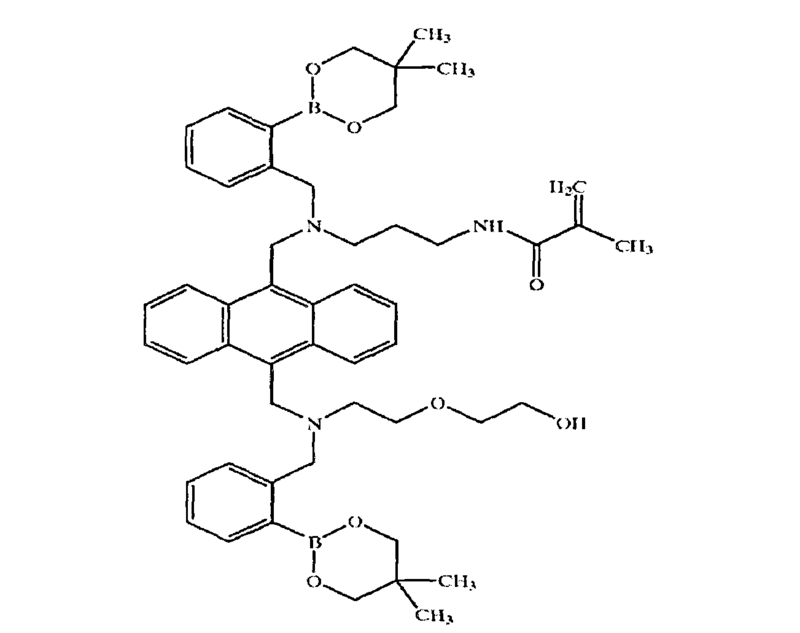 100%, 1 5mL) was added MAPTAC [3- (methacryloylamino) propyl ] trimethylammonium chloride (2. OmL, 1. Og, 4. 54mmol, 50eq), and as an initiator AIBN (azobisisobutyronitrile) in ethanol (O. 183M, 0. 2mL), to give a clear solution. 将它用氮气饱和，然后在I小时内加热到70°C，并保持在70°C下80分钟，得到一粘稠溶液。 It will be saturated with nitrogen, and then heated over I hour to 70 ° C, and maintained at 70 ° C 80 minutes to obtain a viscous solution. 下面表I和表2表示了具有多种浓度的葡萄糖溶液对50 :1和25 :1的指示剂大分子的荧光的调制。  The following Table I and Table 2 shows the glucose solutions having various concentrations of the 50: 1 and 25: 1 of the fluorescent indicator molecules modulation. 表I表示了用四种不同葡萄糖浓度对该实施例的两种不同浓度(15mg/ml和25mg/ml)的25 ： I指示剂大分子的结果。 Table I shows the four different glucose concentrations of the two different concentrations (15mg / ml and 25mg / ml) of Example 25: Results of the indicator I macromolecules. 表2表示了用四种不同葡萄糖浓度对该实施例的两种不同浓度（10mg/ml和20mg/ml)的50 ： I指示剂大分子的结果。 Table 2 shows 50 four different glucose concentrations of the two different concentrations (10mg / ml and 20mg / ml) of Example: Results of the indicator I macromolecules. 这两个表中，Ι/Ιο是暴露于葡萄糖（365nm激发）之后和之前在420nm处的发射强度的比值。 These two tables, Ι / Ιο is prior to and the emission intensity ratio at 420nm after exposure to glucose (365nm excitation). 该实施例说明了与实施例1中制备的5 ： I指示剂大分子有关的令人惊奇且有用的激发物作用。  This Example illustrates the preparation of Example 5 in the embodiment 1: surprising and useful effects associated I excimer cause indicator macromolecules. 图1画出了当暴露于三种浓度的葡萄糖（OmM，30mM和60mM)时，被365nm的光激发后，5 ： I指示剂大分子的发射光谱。  Figure 1 illustrates a three concentrations when exposed to glucose (OmM, 30mM and 60 mM), the excitation light of 365nm, 5: emission spectrum of the indicator I macromolecules. 图1的阴影部分还表示，来自实施例1的非激发物25 ： I指示剂大分子的发射。 Shaded part of Figure 1 further indicates, from Example 1 was non-excited Embodiment 25: I-emitting indicator macromolecules. 激发物发射区域表示了“等吸光区”而不是“等吸光点”。 Excimer emission regions represented with "light-absorbing points, etc." "isosbestic region" instead. 从图1中可以看出，激发物发射区（其中0mM，30mM和60mM葡萄糖线重叠的区域）对葡萄糖浓度的变化不起响应（正与等吸光点一样）。 As it can be seen from Figure 1, the excimer emitter (wherein 0mM, 30mM and 60mM glucose region overlapping lines) can not afford to change in response to glucose concentration (as in n isosbestic point). 激发物发射区开始于比蒽衍生物调制的峰值响应波长大约IOOnm的低磁场处。 Excimer emitter region starts at modulating anthracene derivative peak ratio of the low magnetic field response at wavelengths of about IOOnm. 除了葡萄糖之外，激发物响应于系统所有的其它方面，例如激发强度、温度和PH值。 In addition to glucose, all in response to excitation thereof other aspects of the system, such as excitation intensity, temperature and PH. 因此，理想的参考方案是，其在415nm处的振幅或信号值被515nm处的振幅或信号值或激发物发射区内的另一个波长或波长范围进行电子均分，并将所得值进行漂移和PH误差、动力系数和影响LED强度的漂移、室温变化等方面的校正。 Thus, the reference solution is desirable, which is the signal amplitude or value or another excitation wavelength or wavelength range was 515nm emission region at the electronic sharing or signal amplitude values ​​at 415nm, and the resultant value drift and PH error correction aspect, the drift force coefficient and the influence of the LED intensity, temperature changes. 这将在下面进行说明。 This will be explained below. 用三种不同葡萄糖溶液（OmM，30mM和60mM)测试5 ： I指示剂大分子的葡萄糖调制。  Test 5 with three different glucose solution (OmM, 30mM and 60mM): I glucose modulation indicator macromolecules. 在用于光源和发射光的三种不同分光光度计狭缝构型（1.5为较窄，3为较宽）中，测试每种葡萄糖溶液的发射谱图。 Spectrophotometer at three different configurations of slits and a light source for emitting light (1.5 narrower, wider 3), the emission spectrum of each test glucose solution. 数据表示在表3中。 Data are shown in Table 3. 表中，420nm处的发射强度与550nm处的发射强度之间的比值相对独立于狭缝构型。 The table, the ratio between the emission intensity at 420nm and the emission intensity at 550nm is relatively independent of the slot configuration. 测试了5 :1激发物指示剂大分子的温度稳定性。  Test 5: 1 Temperature Stability excitation indicator macromolecules. 对于暴露于200mM葡萄糖（pH7.5)的lmg/ml 5 ： I激发物指示剂大分子的溶液来说，420nm处与550nm处的发射强度之间的比值室温下为7. 57，大约60°C的温度下为7. 53。 For lmg / ml 5 exposed to 200mM glucose (pH 7.5) is: I excimer molecules the indicator solution, the temperature at the ratio between the emission intensity at 420nm and 7.57 at 550nm is approximately 60 ° C at a temperature of 7.53. 还测试了5 ： I激发物指示剂大分子的pH值稳定性。  Also tested 5: I Stability of the pH indicator excitation macromolecules. 测试了lmg/ml 5 :1激发物指示剂大分子的溶液在三种不同PH值（6. 5,7. O和7. 5)中，420nm处与550nm处的发射强度之间的比值（370nm处的激发光，狭缝1. 5，3)，并表示在表4中。 Tested lmg / ml 5: (. 6. 5,7 O and 7.5) in a ratio of 1 excimer indicator macromolecules in a solution of three different PH values ​​between the 420nm and 550nm emission intensity at the ( excitation slits at 370nm 1. 5,3), and are shown in table 4 below. 整个发射谱图表示在图2中。 The entire emission spectrum is shown in FIG. 测试范围内的变化从统计学上讲是不显著的。 Changes in the test range from a statistical perspective is not significant. 据认为，激发物络合物（假设通过pi电子云）的稳定性超过非激发物蒽衍生物的稳定性，能够扰乱非激发物性能并由此制成好的指示剂的硼酸盐识别特征不能够扰乱更稳定的激发物，这样，激发物就成为非常好的参考指示剂。  It is believed that the complex was excited (assuming by pi electron cloud) stability stability over non-excited anthracene derivative thereof, capable of disturbing non-activated and thus formed was a good indicator of the performance of boric acid salts of identification features can not be disturbed excitation was more stable, so that it becomes a very good excimer reference indicator. 聚合物基质可以相同，事实上在该实施例中是相同的大分子。 May be the same polymeric matrix, in fact in this embodiment is the same macromolecule. 识别元素是敞开并完整的，而识别元素和荧光团中心之间的感应能量影响已经被弱化。 Recognition element is open and complete, and the influence of the induced energy between the fluorophore and the recognition element center has been weakened. 如上所述非常重要，这是由于它免去了分离指示剂和参考分子之间的物理和/或化学环境的需要。  As described above is very important, since it eliminates the need for a physical separation between the reference and indicator molecules and / or chemical environments. 适当的镧系螯合物指示剂组分单体的合成描述在图3中。  The synthesis of the appropriate lanthanide chelate indicator constituent monomers 3 in FIG. 化合物⑴和⑵可以从德克萨斯州理查森的Macrocyclics公司购得（化合物（2)被称作P-NH2-Bz-DOTA)。 ⑴ ⑵ commercially available and compound (Compound (2) it is referred to as P-NH2-Bz-DOTA) from Macrocyclics of Richardson, Texas, company. 最终产物（9)可以与一种或多种其它单体共聚而形成指示剂大分子。 The final product (9) may be associated with one or more other comonomers to form the indicator macromolecules. A、9-氣甲基-10-[ [2-(2-轻基乙氧基）乙基氣基]-甲基]恩盐酸盐向9, IO- _.(氯甲基）蒽（5. 18g, 18. 8mmole, 3. 99eq)在200mLNMP的悬浮液中加入2-(2-氨基乙氧基）乙醇（O. 495g，0. 475mL，4. 7ImmoIe)。  A, 9- gas-10- [[2- (2-light-yl) ethyl gas-yl] - methyl] En hydrochloride To 9, IO- _ (chloromethyl. ) anthracene (5. 18g, 18. 8mmole, 3. 99eq) was added 2- (2-aminoethoxy) ethanol (O. 495g, 0. 475mL, 4. 7ImmoIe) in 200mLNMP suspension. 将该混合物黑暗中搅拌17小时。 The mixture was stirred for 17 hours in the dark. 同时，将反应混合物50°C真空下浓缩到约50mL。 At the same time, the reaction mixture was concentrated to about 50mL at 50 ° C in vacuo. 将残留物用硅胶色谱分离（150g种类级硅胶，0-10% CH3OH/CH2CL2)来提纯，得到O. 425g(24% )黄色/橙色固体。 The residue was chromatographed on silica gel (150g type grade silicone, 0-10% CH3OH / CH2CL2) to afford O. 425g (24%) as a yellow / orange solid. TLC =Merck 硅胶60 板，70/30 的CH2CL2/CH30H 的Rf O. 72，用UV (254/366)检测，茚三酮染料。  TLC = Merck silica gel 60 plates, Rf O. 70/30 of CH2CL2 / CH30H 72, with UV (254/366) detecting, ninhydrin dye. HPLC ：HP 1100 HPAL 色谱分离，Vydac 201TF 10 X 250mm 的柱子，O.1OOmL 进样，2mL/mi η,在370nm 处检测，A =水（O.1 % HFBA)，B = MeCN (O.1 % HFBA)，梯度：10 % 的B 洗涤2mi n，10-80%的B洗涤18分钟，用80-100%的B洗涤2min，用100%的B洗涤2min，停留时间16.1min。  HPLC: HP 1100 HPAL chromatography, Vydac 201TF 10 X 250mm column, O.1OOmL sample, 2mL / mi η, detection at 370nm, A = water (O.1% HFBA), B = MeCN ( O.1% HFBA), gradient: 10% B wash of 2mi n, washed with 18% B 10-80 min 80-100% B washed with 2min, washed with 100% of B 2min, the residence time 16.1min. 23 °C 下，向N-(3-氨基丙基）甲基丙烯酰胺（3. 08g, 17. 2mmole, 4. 2eq)、DIEA (5. 19g,7. OOmL, 40. lmmole,9. 8eq)和约3mgBHT在125mL CHCL3 的悬浮液中，滴加9-氯甲基-10-[[2-(2-轻基乙氧基）乙基氨基]-甲基]蒽氢氯酸盐（1. 56g,4.1OmmoIe)在25mL CHCL3中的溶液。 The  23 ° C, the N- (3- aminopropyl) methacrylamide (3. 08g, 17. 2mmole, 4. 2eq), DIEA (5. 19g, 7. OOmL, 40. lmmole, 9. 8eq) in about 125mL CHCL3 3mgBHT suspension was added dropwise 9-chloro-10 - [[2- (2-ethoxy light-yl) ethylamino] - methyl] anthracene hydrochloride (1. 56g, 4.1OmmoIe) solution in 25 mL of CHCl3. 随后将该混合物在黑暗中搅拌92小时。 The mixture was then stirred in the dark for 92 hours. 同时，将反应混合物过滤并用2X40mL NaHCO3 (饱和水溶液）洗涤。 At the same time, the reaction mixture was filtered and washed with 2X40mL NaHCO3 (saturated aqueous solution). 将有机提取物在无水Na2SO4上干燥，过滤并浓缩，得到一粘性的橙色固体，将它用氧化铝色谱分离法（50g活化的中性氧化铝，0-5% CH3OH/CH2CL2)提纯得到O. 364g(20% )的橙色固体。 The organic extract was dried over anhydrous Na2SO4, filtered, and concentrated to give a sticky orange solid which alumina chromatography (50g of activated neutral alumina, 0-5% CH3OH / CH2CL2) to give purified O . 364g (20%) of an orange solid. TLC :Merck 硅胶60 板，70/30 的CH2CL2/CH30H 的Rf O. 16，用UV (254/366)检测，茚三酮染料。  TLC: Merck silica gel 60 plates, Rf O. 70/30 of CH2CL2 / CH30H 16, with UV (254/366) detecting, ninhydrin dye. HPLC ：HP 1100 HPLC 色谱分离，Vydac 201TP10X250mm 的柱子，O.1OOmL 进样，2mL/min，在370nm 处检测，A =水(O. 1% HFBA)，B = MeCN(O. 1% HFBA)，梯度：10% 的B 洗涤2min，10-80%的B洗涤18分钟，用80-100%的B洗涤2min，用100%的B洗涤2min，停留时间16. 85mi η。  HPLC: HP 1100 HPLC chromatography, Vydac 201TP10X250mm column, O.1OOmL sample, 2mL / min, detection at 370nm, A = water (O. 1% HFBA), B = MeCN (O 1%. HFBA), gradient: 10% B wash 2min, washed with 10-80% of the B 18 min, washed with 80-100% of the B 2min, washed with 100% of the B with 2min, the residence time 16. 85mi η. 23°C下,将9-[[2_(2_轻基乙氧基）_乙基氨基]甲基-10_[[ (3_甲基丙烯酰胺）丙基氨基]甲基]]惠(O. 343g,O. 763mmole)，DIEA(O. 965g,1. 30mL,9. 8eq)和(2-漠甲基苯基）硼酸新戊基酯（L09g，3.85mmol e，5. Oeq)在20mL CHCL3中的溶液黑暗中搅拌25小时。 The  23 ° C, the 9 - [[2_ (2_ light-yl-ethoxy) ethylamino _] _ -10-methyl [[(3_ methacrylamide) propylamino] methyl]] Hui (O. 343g, O. 763mmole), DIEA (O. 965g, 1. 30mL, 9. 8eq) and (2 desert-methylphenyl) boronic acid neopentyl ester (L09g, 3.85mmol e, 5. Oeq ) in 20 mL CHCl3 was stirred in the dark was 25 hours. 同时，将该反应混合物开始用旋转式汽化器浓缩，然后用真空泵除去DIEA。 At the same time, the reaction mixture was concentrated on a rotary evaporator starts, followed by a vacuum pump to remove DIEA. 将残留物用氧化铝柱式色谱分离法（40g活化的中性氧化铝，0-10% CH30H/CH2CL2)纯化得到O. 299g(46%)的桔黄色固体。 The residue was purified by alumina column chromatography (40g of activated neutral alumina, 0-10% CH30H / CH2CL2) to give O. 299g (46%) of an orange solid. 将该产物与一种或多种其它单体共聚，制成指示剂大分子。 The product with one or more other copolymerizable monomers, the indicator is made of macromolecules. 该硼酸根基团在使用之前应当去保护。 The acid radicals should deprotection prior to use. FAB MS :计算的C51H65B2N3O7 的[M]+ 为865，发现[M+1]+ 为855。  FAB MS: calculated [M] C51H65B2N3O7 + of 865, found [M + 1] + 855. TLC :Merck 碱性氧化铝板，95/5 的CH2CL2/CH30H 的Rf O. 35，用UV (254/366)检测。  TLC: Merck basic alumina plates, Rf O. 95/5 of CH2CL2 / CH30H 35, detection UV (254/366). HPLC :HP1100HPLC 色谱分离，Vydac 201TP10 X 250mm 的柱子，O.1OOmL 进样，2mL/min,在370nm 处检测，A =水(O. 1% HFBA)，B = MeCN (O.1 % HFBA)，梯度:10 % 的B 洗涤2min，10-80%的B洗涤18分钟，用80-100%的B洗涤2min，用100%的B洗涤2min，停留时间19. 7min。  HPLC: HP1100HPLC chromatography, Vydac 201TP10 X 250mm column, O.1OOmL sample, 2mL / min, detection at 370nm, A = water (O. 1% HFBA), B = MeCN (O.1% HFBA), gradient: 10% B wash 2min, washed with 10-80% of the B 18 min, washed with 80-100% of the B 2min, washed with 100% of the B with 2min, the residence time 19. 7min. 将 9，10-二（氯甲基）蒽（1. 5g，5. 45mmole)、DIEA(28. 17g，38. 00mL，218mmole，40eq)、N-(3-氨基丙基)甲基丙烯酰胺氢氯酸盐(9. 76g, 54. 5mmole, 10. Oeq)和约5mgBHT在200mL23°C的CHCL3中的悬浮液在40°C的黑暗中搅拌4天。  9,10-bis (chloromethyl) anthracene (1. 5g, 5. 45mmole), DIEA (28. 17g, 38. 00mL, 218mmole, 40eq), N- (3- aminopropyl) methyl acrylamide hydrochloride (9. 76g, 54. 5mmole, 10. Oeq) in about 5mgBHT CHCL3 200mL23 ° C in the dark suspension was stirred at of 40 ° C for 4 days. 同时，将温度增加到45°C，并将该混合物再搅拌3天。 Meanwhile, the temperature was increased to 45 ° C, and the mixture was stirred for 3 days. 此时，形成沉淀物。 At this time, a precipitate formed. 将混合物过滤,并将固体产物溶解在少量CH2CL2中。 The mixture was filtered, and the solid product was dissolved in a small amount of CH2CL2. 一整夜形成了黄色结晶固体，即期望产物的双氢氯酸盐（定量3. 15g)。 A yellow crystalline solid was formed overnight, i.e. dihydrotestosterone chlorate desired product (quantitative 3. 15g). TLC =Merck 碱性氧化铝板，90/10 的CH2CL2/CH30H 的Rf O. 31，用UV (254/366)检测。  TLC = Merck basic alumina plates, Rf O. CH2CL2 / CH30H 90/10, 31, (254/366) for detecting UV. HPLC ：HP 1100 HPLC 色谱分离，水5 X IOOmmNovapak HR C18 的柱子，O.1OOmL 进样，O. 75mL/min，在360nm 处检测，A =水(O. 1% HFBA)，B = MeCN(O. 1% HFBA)，梯度：10%的B洗涤2min，10-80 %的B洗涤18分钟，用80-100 %的B洗涤2min，用100 %的B洗涤2min,停留时间19. 7min。  HPLC:. HP 1100 HPLC chromatography, aqueous 5 X IOOmmNovapak HR C18 column, O.1OOmL injection, O 75mL / min, detection at 360nm, A = water (O. 1% HFBA), B = MeCN (O 1% HFBA. ), gradient: 10% B wash 2min, washed with 10-80% of the B 18 min, washed with 80-100% of the B 2min, washed with 100% of the B with 2min, residence time 19. 7min. 23°C下,将9,10-二[3_(甲基丙烯酰胺）_丙基氨基]甲基蒽（O. 650g,1. 34mmole游离胺)、DIEA(O. 612g，0. 825mL，4. 74mmole,3. 55eq)、（2-溴甲基苯基）硼酸新戊基酯(1. 34g，4. 74mmole,3. 55eq)和BHT (5mg，作为引发剂)在20mL的CHCL3中的悬浮液黑暗中搅拌5天。 The  23 ° C, 9,10-bis [3_ (methacrylamide) _ propylamino] methylanthracene (O. 650g, 1. 34mmole free amine), DIEA (O. 612g, 0. 825mL, 4. 74mmole, 3. 55eq), (2- bromomethylphenyl) boronic acid neopentyl ester (1. 34g, 4. 74mmole, 3. 55eq) and BHT (5mg, as initiator) in 20mL of the suspension was stirred in the dark CHCL3 5 days. 此时，将反应混合物在真空中浓缩，并将残留物用氧化铝色谱分离法（200g活化的中性氧化铝，0-2% CH30H/CH2CL2)提纯，得到O. 465g(39% )非常粘稠的黄色油。 At this time, the reaction mixture was concentrated in vacuo and the residue was purified by chromatography on alumina (200g activated neutral alumina, 0-2% CH30H / CH2CL2) to afford O. 465g (39%) very viscous thick yellow oil. TLC =Merck 碱性氧化铝板，90/10 的CH2CL2/CH30H 的Rf O. 59，用UV (254/366)检测。  TLC = Merck basic alumina plates, Rf O. CH2CL2 / CH30H 90/10, 59, (254/366) for detecting UV. HPLC ：HP 1100 HPLC 色谱分离，水5 X IOOmm Novapak HR C18 的柱子，O. 050mL 进样，O. 75mL/min，在360nm 处检测，A =水(O. 1% HFBA)，B = MeCN(O. 1% HFBA)，梯度：10%的B洗涤2min，10-80 %的B洗涤18分钟，用80-100 %的B洗涤2min，用100 %的B洗涤2min,停留时间19. 7min。  HPLC:.. HP 1100 HPLC chromatography, aqueous 5 X IOOmm Novapak HR C18 column, O 050mL injection, O 75mL / min, detection at 360nm at, A = water (O. 1% HFBA), B = MeCN (O 1% HFBA. ), gradient: B 10% of the washed 2min, washed B 10-80% in 18 min, washed B 80-100% by 2min, washed with a B 100% 2min, residence time 19 . 7min. 制备N，N-二甲基丙烯酰胺（40% wt)和N，N'-亚甲基二丙烯酰胺（O. 8% wt)在乙二醇中的溶液。  Preparation of N, N- dimethylacrylamide (40% wt) and N, N'- methylenebis solution of acrylamide (O. 8% wt) in ethylene glycol. 将9，10-二[N-[2-(5，5-二甲基硼-2-基）-苄基]-N-[3-(甲基丙烯酰胺）丙基氨基]甲基蒽（17. 8mg, 2 X10^5moIe)和40 μ L过硫酸铵水溶液（5% wt)与ImL乙二醇单体组合物混合。 9,10-bis [N- [2- (5,5- dimethyl-boron 2-yl) - benzyl] -N- [3- (methacrylamido) propylamino] methylanthracene ( 17. 8mg, 2 X10 ^ 5moIe) and 40 μ L aqueous solution of ammonium persulfate (5% wt) was mixed with ImL glycol monomer composition. 将所得溶液放在单体吹扫的手套箱中。 The resulting solution was placed in glove box purged monomer. 将N，N，K ,N1-四甲基乙二胺的水溶液（80 μ L，5% wt)加入到单体溶液中来加速聚合。 The N, N, K, N1- tetramethylethylenediamine aqueous solution (80 μ L, 5% wt) was added to the monomer solution to accelerate polymerization. 将所得单体组合物倒入显微镜载玻片和100微米不镑钢定距片构成的|吴板中。 The resultant monomer composition was poured onto microscope slides and 100 micron not pound steel sheet composed of spacer | WU plate. 在氣气气氛中保持8小时后,将|吴板放在磷酸盐缓冲盐水（PBS) (10mMPBS,pH = 4)，分离显微镜载玻片，并移出水凝胶。 After keeping in a gas atmosphere for 8 hours, the | WU plate in phosphate-buffered saline (PBS) (10mMPBS, pH = 4), the microscope slides were separated, and the hydrogel was removed. 将水凝胶用IOOmL含有ImM月桂基磷酸钠盐和ImMEDTA钠盐的PBS洗涤3天，其中溶液每天更换，随后用DMF/PBS (10/90vol/vol, 3 X IOOmL)洗涤，最后用PBS (pH = 7. 4, 3 X IOOmL)洗涤。 Washed with PBS ImM sodium lauryl salt and sodium salt hydrogel containing ImMEDTA with IOOmL 3 days, the solution changed every day, followed by (, 3 X IOOmL 10 / 90vol / vol) was washed with DMF / PBS, and finally with PBS ( washed with pH = 7. 4, 3 X IOOmL). 所得水凝胶聚合物保存在含有O. 2wt%叠氮化钠和ImMEDTA钠盐的PBS中（10mL，pH = 7. 4)。 The resultant hydrogel polymer stored in PBS containing O. 2wt% sodium azide and sodium salt of ImMEDTA (10mL, pH = 7. 4). 测试该实施例中制备的指示剂大分子（它含有两种识别元素）通过葡萄糖、乳酸盐和乙酰乙酸盐对荧光的调制。  The test indicator macromolecules prepared in the embodiment (which contains two recognition elements) by glucose, lactate and acetoacetate modulation of the fluorescence. 图4表示，在含有不同含量L乳酸钠、乙酰乙酸锂或aD-葡萄糖的IOmMPBS中，该实施例的水凝胶的规一化荧光发射（427nm处的1/%)，其中PBS的pH为7. 4，含有O. 2% NaN3和ImM EDTA。 Figure 4 shows, at different contents IOmMPBS L sodium lactate, lithium acetoacetate or glucose aD-, embodiments of the normalized fluorescence emission hydrogel of Example (1 /% 427nm at), which is pH PBS 7 4. O. 2% NaN3 and containing ImM EDTA. 在37°C的低灵敏度下，利用温度控制的样品夹具，利用365nm激发（狭缝=3nm)和427nm发射（狭缝=3nm)的Shimadzu RF-5301分光荧光计记录数据。 Low sensitivity at 37 ° C, the use of temperature-controlled sample holder, with excitation of 365 nm (slit = 3nm) and emission 427nm (slit = 3nm) a Shimadzu RF-5301 spectrofluorometer recording data. 37°C，将含有3mL所需溶液的吸收池在测试之前平衡15分钟。 37 ° C, the solution containing the desired cuvette 3mL equilibrium prior to testing for 15 min. 将每种水凝胶样品在四个独立样品中测试。 Each hydrogel sample was tested in four independent samples. 误差线是每个数值点四倍值的标准偏差。 Error bars are standard deviation for each value 2.4 times the value. 含有葡萄糖识别分子的水凝胶是按照上述方法制备的。 The hydrogel containing the glucose recognition molecule were prepared according to the method described above. 在吸收池中，将水凝胶与入射光成45°角放在玻璃载玻片上，并用聚酯掩模覆盖。 In the absorption cell, the hydrogel incident angle of 45 ° on the glass slide and covered with a polyester mask. 在含有O. 2% NaN3和ImM EDTA、pH为7. 4的IOmMPBS 中，制备1、5、10 和20mML 乳酸钠(Aldrich)，5、10 和20mM 乙酰乙酸锂(Aldrich)和1、2、4、5、10和20mM a -D-葡萄糖的溶液。 Containing O. 2% NaN3 and ImM EDTA, pH is IOmMPBS 7. 4, the preparation of 1,5,10 20mML and sodium lactate (Aldrich), 5,10 and 20mM lithium acetoacetate (Aldrich) and 2,4 , 5, 10 and 20mM a -D- glucose solution. 共聚物的荧光受存在的葡萄糖的影响，但不受乳酸盐或乙酰乙酸盐的影响。 Fluorescence copolymers by the presence of glucose, but not affect lactate or acetoacetate. 23C 下,向2-(2-氨基乙氧基)乙醇(31. 4g, 30. OmT,, 299mmole, 20. 9eq)在40mLCHCl3的溶液中加入9，10- 二（氯甲基）蒽（3. 94g，14. 3mmol e)。  23C, the solution of 2- (2-aminoethoxy) ethanol (31. 4g, 30. OmT ,, 299mmole, 20. 9eq) was added 9,10-bis (chloromethyl) in solution in 40mLCHCl3 anthracene (3. 94g, 14. 3mmol e). 将溶液在黑暗中搅拌67小时。 The solution was stirred in the dark for 67 hours. 此时,加入IOOmL CH2Cl2,并将溶液用IX 50ml和2 X IOOmLNaHCO3 (饱和水溶液)洗涤。 At that point, IOOmL CH2Cl2, washed (saturated aqueous) and 2 X IOOmLNaHCO3 IX 50ml and the solution. 将有机提取物在无水Na2SO4上干燥，过滤并浓缩，得到4. 67% (79% )的黄色粉末。 The organic extracts were dried over Na2SO4 anhydrous, filtered, and concentrated to give 4.67% (79%) of a yellow powder. 将产物（RP-HPLC测试，85%的纯度）按照下面的方式进行下去。 The product (RP-HPLC test, 85% purity) proceed in the following manner. HPLC条件：HP 1100HPLC色谱分离，Vydac 201TP10X250mm的柱子，O.1OOmL进样，2mL/min,在370nm 处检测，A =水(O.1 % HFBA)，B = MeCN(O.1 % HFBA)，梯度：10% 的B 洗涤2min，10-80%的B洗涤18分钟，用80-100%的B洗涤2min，用100%的B洗涤2min，停留时间15. 6min。  HPLC Conditions: HP 1100HPLC chromatography, Vydac 201TP10X250mm column, O.1OOmL sample, 2mL / min, detection at 370nm, A = water (O.1% HFBA), B = MeCN (O.1% HFBA), gradient: 10% B wash 2min, washed with 10-80% of the B 18 min, washed with 80-100% of the B 2min, washed with 100% of the B with 2min, the residence time 15. 6min. 9. 75mmole)、DIEA (12. 6g, 17. OmL, 97. 5mmoIe, 10. Oeq)、和(2-漠甲基-苯基)砸酸新戍基酯(13. 7g,48mmole,4. 9eq)在125mLCHCl3中的溶液黑暗中搅拌46小时。 9. 75mmole), DIEA (12. 6g, 17. OmL, 97. 5mmoIe, 10. Oeq), and (2-methyl desert - phenyl) new drop acid pentyl ester (13. 7g, 48mmole, 4. 9 eq) was stirred in the dark 125mLCHCl3 46 hours. 此时，将该反应混合物开始用旋转式汽化器浓缩，然后用真空泵除去DIEA。 At this time, the reaction mixture was concentrated on a rotary evaporator starts, DIEA then removed with a vacuum pump. 将残留物用氧化铝柱式色谱分离法（150g活化的中性氧化铝，0-3% CH30H/CH2CL2)纯化得到5. 67g(70% )的粘稠油，将其静置固化。 The residue was purified by alumina column chromatography (150g of activated neutral alumina, 0-3% CH30H / CH2CL2) to give 5. 67g (70%) of a viscous oil, which solidified on standing. 将产物（RP-HPLC测试，85%的纯度）按照下面的方式进行下去。 The product (RP-HPLC test, 85% purity) proceed in the following manner. TLC :Merck 碱性氧化铝板，95/5 的CH2CL2/CH30H 的Rf O. 33，用UV (254/366)检测。  TLC: Merck basic alumina plates, Rf O. 95/5 of CH2CL2 / CH30H 33, detection UV (254/366). HPLC 条件：HP 1100 HPLC 色谱分离，Vydac 201TP 10 X 250mm 的柱子，O.1OOmL 进样，2mL/min，在370nm 处检测，A =水(O. 1% HFBA),B = MeCN(O. 1% HFBA)，梯度：10% 的B洗涤2min，10-80%的B洗涤18分钟，用80-100%的B洗涤2mi n，用100%的B洗涤2min，停留时间18. 8min。  HPLC Conditions: HP 1100 HPLC chromatography, Vydac 201TP 10 X 250mm column, O.1OOmL sample, 2mL / min, detection at 370nm, A = water (O. 1% HFBA), B = MeCN ( O. 1% HFBA), gradient: B 10% of the washed 2min, washed B 10-80% in 18 min, washed B 80-100% of 2mi n, B 100% washed with 2min, the residence time 18. 8min . 23°C 下，将9，10-二[N-[2_(5，5_ 二甲基-[1，3，2] 二氧杂硼烷_2_ 基）苄基]-N-[2-(2-羟基乙氧基）乙基氨基]甲基]-蒽（O. 298g，0. 359mmole)、甲基丙烯酸(O. 304g, O. 300mL, 3. 53mmole,9. 84eq)、DCC (0. 965g, 4. 68mmole, 13. Oeq)和N, N- 二甲基氨基吡啶(O. 020g，0. 16mmol e，0. 46eq)在15mL CH2CL2中的溶液黑暗中搅拌4小时。 The  23 ° C, 9,10-bis [N- [2_ (5,5_ dimethyl - [1,3,2] dioxaborolane _2_ yl) benzyl] -N- [ 2- (2-hydroxyethoxy) ethylamino] methyl] - anthracene (. O. 298g, 0 359mmole), methacrylic acid (O. 304g, O. 300mL, 3. 53mmole, 9 84eq. ), DCC (0. 965g, 4. 68mmole, 13. Oeq) and N, N- dimethylaminopyridine (O. 020g, 0. 16mmol e, 0. 46eq) was stirred in 15 mL CH2Cl2 was dark for 4 hours. 此时，将反应混合物过滤并通过旋转式汽提器干燥。 At this time, the reaction mixture was filtered and dried by a rotary stripper. 将残留物用氧化铝柱式色谱分离法（50g活化的中性氧化铝，0-4% CH3(WCH2CL2)纯化得到O. 150g(47% )的黄色固体。 The residue was purified by alumina column chromatography (50g of activated neutral alumina, 0-4% CH3 (WCH2CL2) to give O. 150g (47%) as a yellow solid. FAB MS :计算的C52H66B2N2O9 的[M]+ 为885，发现[M+1]+ 为886。  FAB MS: calculated in C52H66B2N2O9 [M] + 885, found [M + 1] + 886. TLC :Merck 碱性氧化铝板，95/5 的CH2CL2/CH30H 的Rf O. 45，用UV (254/366)检测。  TLC: Merck basic alumina plates, Rf O. 95/5 of CH2CL2 / CH30H 45, detection UV (254/366). HPLC ：HP 1100HPLC 色谱分离，Vydac 201TP10 X 250mm 的柱子，O.1OOmL 进样，2mL/min,在370nm 处检测，A =水(O. 1% HFBA)，B = MeCN (O.1 % HFBA)，梯度:10 % 的B 洗涤2min，10-80%的B洗涤18分钟，用80-100%的B洗涤2min，用100%的B洗涤2min，停留时间2 Imin。  HPLC: HP 1100HPLC chromatography, Vydac 201TP10 X 250mm column, O.1OOmL sample, 2mL / min, detection at 370nm, A = water (O. 1% HFBA), B = MeCN (O.1 % HFBA), gradient: 10% B wash 2min, washed with 10-80% of the B 18 min, washed with 80-100% of the B 2min, washed with 100% of the B with 2min, residence time 2 Imin. 向[2-(甲基丙烯酰胺）乙基]三甲基氯化铵（TMAMA，70wt^^K溶液，O. 344g单体，1. 66mmol e，50eq)在O. 600mL 水中的水溶液中加入9-[N_[2_(5，5_ 二甲基-[1，3，2] 二氧杂硼烧_2_基）节基]-N-[2_(2-甲基丙烯酸胺乙氧基）乙基氨基]甲基]-10-[N-[2_(5,5-二甲基-[1，3, 2] 二氧杂硼烧-2-基）节基]-N-[2_(2-甲基丙烯酸胺乙氧基）乙基氨基]甲基]蒽（O. 029g,O. 033mmol e)在3. OOmLMeOH中的溶液。  (344g monomer, 1. 66mmol e TMAMA, 70wt ^^ K solution, O., 50eq) of [2- (methacrylamide) ethyl] trimethylammonium chloride at O. 600mL water aqueous solution was added 9- [N_ [2_ (5,5_ dimethyl - [1,3,2] dioxaborolan burn _2_ yl) section yl] -N- [2_ (2- ethyl methacrylate amine yloxy) ethylamino] methyl] -10- [N- [2_ (5,5- dimethyl - [1,3, 2] dioxaborolan-2-yl burn) section yl] -N- [2_ (2-acrylamide-ethoxy) ethylamino] solution of methyl] anthracene (O. 029g, O. 033mmol e) of the 3. OOmLMeOH. 向该混合物中加入4,4'-偶氮二（4-氰基戍酸）（O. 0075g,0. 027mmole,总单体的1. 6mole% )。 To this mixture was added 4,4'-azobis (4-cyanovaleric acid Shu) (O. 0075g, 0. 027mmole, 1. 6mole% of total monomer). 将该溶液通过O. 45 μ膜过滤器过滤，吹入氮气，然后在黑暗中55°C下加热16小时。 The solution was filtered through a membrane filter O. 45 μ, blowing nitrogen gas, and then heated in the dark 55 ° C 16 h. 此时，将粘稠溶液冷却到25°C，并在真空中浓缩。 At this time, the viscous solution was cooled to 25 ° C, and concentrated in vacuo. 将残留物用20mL水稀释，并通过O. 2 μ的膜过滤器过滤。 The residue was diluted with 20mL water and filtered through a membrane filter of O. 2 μ. 将聚合物溶液相对于2 X 4L水用纤维素乙酸酯膜（MWC0 3500)透析。 The polymer solution with respect to 2 X 4L water with cellulose acetate film (MWC0 3500) dialysis. 透析中得到38. 5mL聚合物溶液。 38. 5mL dialyzed polymer solution was obtained. 浓缩部分溶液至干燥，说明每1. OmL溶液中有0.0075g聚合物。 Portion of the solution was concentrated to dryness, the description of each solution has 1. OmL 0.0075g polymer. 聚合物的总收率为0. 289g(77% )。 The total yield of the polymer was 0. 289g (77%). 在的葡萄糖的影响，但不受乳酸盐或乙酰乙酸盐的影响。 The influence of glucose, but not affect the lactate or acetyl acetate. OV 下，将9，10-二[N-[2_(5，5-二甲基-[1，3，2] 二氧杂硼烷_2_ 基）苄基]-N-[2-(2-羟基乙氧基）乙基氨基]甲基]-蒽（O. 100g，0. 120mmole)、甲基丙烯酸(O. 112g，0.1lOmL,1. 30mmole, 10. 8eq)、DCC(O. 316g,1. 63mmole, 12. 8eq)和N，N_ 二甲基氨基吡啶(0. 014g，0. llmmole,0. 92eq)在5mL CH2CL2中的溶液搅拌I小时，然后在23 V下搅拌22小时。  Under OV, 9,10-bis [N- [2_ (5,5- dimethyl - [1,3,2] dioxaborolane _2_ yl) benzyl] -N- [2 - (2-hydroxyethoxy) ethylamino] methyl] - anthracene (. O. 100g, 0 120mmole), methacrylic acid (. O. 112g, 0.1lOmL, 1 30mmole, 10. 8eq), DCC ( O. 316g, 1. 63mmole, 12. 8eq) and N, N_-dimethylaminopyridine (0. 014g, 0. llmmole, 0. 92eq) was stirred I h 5mL CH2CL2 was then stirred at 23 V 22 hours. 此时，将反应混合物过滤并通过旋转式汽提器干燥。 At this time, the reaction mixture was filtered and dried by a rotary stripper. 将残留物用氧化铝柱式色谱分离法（30g活化的中性氧化铝，0-2% CH30H/CH2CL2)纯化得到O. 030g(26% )的黄色固体。 The residue was purified by alumina column chromatography (30g of activated neutral alumina, 0-2% CH30H / CH2CL2) to give O. 030g (26%) as a yellow solid. 将该产物与一种或多种其它单体共聚得到一指示剂大分子。 The product with one or more other copolymerizable monomers to give a macromolecular indicator. 其硼酸盐基团在使用前去保护。 Boronic acid salt groups which go use protection. FAB MS:计算的C56H7tlB2N2O1。  FAB MS: calculated C56H7tlB2N2O1. 的[M]+为953，发现[M] + (弱的分子离子峰)为951。 The [M] + 953, found [M] + (weak molecular ion peak) 951. TLC :Merck 碱性氧化铝板，95/5 的CH2CL2/CH30H 的Rf 0. 67，用UV (254/366)检测。  TLC: Merck basic alumina plates, 95/5 CH2CL2 / CH30H in Rf 0. 67, (254/366) for detecting UV. HPLC ：HP 1100 HPLC 色谱分离，水5X 100_ NovaPak HR C18 的柱子，0.100mL进样，0. 75mL/min，2mL 注射循环，在370nm 处检测，A =水（0. 1% HFBA)，B = MeCN(0. 1%HFBA)，梯度：10%的B洗涤2min，10-80%的B洗涤18分钟，用80-100%的B洗涤2min，用100%的B洗漆2min,停留时间19. 6min。  HPLC:. HP 1100 HPLC chromatography, water 5X 100_ NovaPak HR C18 column, 0.100 mL injection, 0 75mL / min, 2mL injection cycle, at 370nm detection, A = water (0. 1% HFBA) , B = MeCN (0 1% HFBA. ), gradient: B 10% of the washed 2min, washed with 10-80% of the B 18 min, 80-100% of the B washed with 2min, wash with 100% B paint 2min, The residence time 19. 6min. 0. OlOmmole)和O. 020mL过硫酸铵的5wt%A溶液与O. 500mL乙二醇单体溶液混合。 0. OlOmmole) 500mL of ethylene glycol monomer solution and mixing 5wt% A and O. O. 020mL solution of ammonium persulfate. 将该溶液放置在氮气吹扫下的手套箱中。 The solution was placed in a glove box under a nitrogen purge. 将N，N，N'，N'-四甲基乙二胺的水溶液（0.040mL，5%wt)加入到单体溶液中来加速聚合。 The N, N, N ', N'- tetramethylethylenediamine aqueous solution (0.040mL, 5% wt) was added to the monomer solution to accelerate polymerization. 将所得单体组合物倒入显微镜载玻片和100微米不锈钢定距片构成的模板中。 The resultant monomer composition was poured onto microscope slides and 100 micron stainless steel spacer sheet consisting of the template. 在氮气气氛中保持8小时后，将模板放在磷酸盐缓冲盐水（PBS，PH = 4)，分离显微镜载玻片，并移出水凝胶。 After maintaining in a nitrogen atmosphere for 8 hours, the template in phosphate buffered saline (PBS, PH = 4), the microscope slides were separated, and the hydrogel was removed. 将水凝胶用IOOmL含有ImM月桂基磷酸钠盐的PBS洗涤3天，其中溶液每天更换，随后用Me0H/PBS(20/80VOl/VOl，3X IOOmL)洗涤，最后用PBS (3 X IOOmL)洗涤。 Washed with PBS ImM sodium salt of lauryl hydrogel contains a IOOmL 3 days, the solution changed every day, followed by Me0H / PBS (20 / 80VOl / VOl, 3X IOOmL) washed, and finally with PBS (3 X IOOmL) . 所得水凝胶聚合物保存在含有O. 2wt%叠氮化钠和ImMEDTA钠盐的PBS 中(pH = 7. 4)。 The resultant hydrogel polymer stored in PBS containing O. 2wt% sodium azide and ImMEDTA a sodium salt (pH = 7. 4). 1. 5nm)的Shimadzu RF-5301分光荧光计在高灵敏度下进行的。 1. 5nm) a Shimadzu RF-5301 spectrofluorometer performed at a high sensitivity. 37°C，将含有3mL所需葡萄糖溶液（0、1、2、4、5、10、20葡萄糖）的吸收池在测试之前平衡30分钟。 37 ° C, the cuvette containing the desired 3mL glucose solution (glucose 0,1,2,4,5,10,20) equilibrium prior to testing for 30 min. 利用单指数函数来适合原始荧光数据。 Using a single exponential function to fit the raw fluorescence data. 将 3,4_ 二轻基-9,10-二氧_2_ 惠横酸氣（96mg, O. 28mmole)和N-(3-氛基丙基）甲基丙烯酰胺氢氯酸（108mg, O. 6mmol e)与20mLCH2CL2混合。  The two light-9,10-dioxo-3,4_ benefits _2_ cross acid gas (96mg, O. 28mmole) and N- (3- atmosphere propyl) methacrylamide hydrochloric acid (108 mg of , O. 6mmol e) mixing with 20mLCH2CL2. 将混合物在室温下搅拌24小时，过滤并蒸发溶剂。 The mixture was stirred at room temperature for 24 hours, filtered and the solvent was evaporated. 将所得固体进行Si02 (IOg)上的柱式色谱分离法分离，其中以CH2CL2/MeOH(90/10)作洗脱液。 The resulting solid was separated column chromatography on Si02 (IOg), which CH2CL2 / MeOH (90/10) as eluent. 所得产物是红色固体（80mg，收率64% )。 The resulting product is a red solid (80mg, 64% yield). FAB MS ：计算的C21H20B2N2O7S 的[M] + 为445，发现[M] + 为445。  FAB MS: calculated C21H20B2N2O7S of [M] + 445, found [M] + 445. 25°〇下，向^(3-氨基丙基）甲基丙烯酰胺氢氯酸盐（3. 00g，16. 8mmole，2. 21eq)、DIEA (6. 5g, 8. 8mL, 50mmole, 6. 6eq)、对苯二甲醒(1. 02g, 7. 60mmole)和Na2SO4 (107g，75. 3mmole,9. 91eq)在75mL无水MeOH中的溶液黑暗中搅拌18小时。 The  25 ° square, to ^ (3-aminopropyl) methacrylamide hydrochloride (3. 00g, 16. 8mmole, 2. 21eq), DIEA (6. 5g, 8. 8mL, 50mmole , 6. 6eq), terephthaloyl awake (1. 02g, 7. 60mmole) and Na2SO4 (107g, 75. 3mmole, 9. 91eq) was stirred in the dark at 75mL anhydrous MeOH for 18 hours. 此时，将溶液过滤并向滤液中按比例加入NaBH4(l. 73g，45. 7mmole，6. Oleq)，随后在25°C下搅拌21小时。 At this time, the solution was filtered and the filtrate was added proportionally NaBH4 (l. 73g, 45. 7mmole, 6. Oleq), followed by stirring at 25 ° C 21 h. 将悬浮液通过Ceit e过滤并浓缩滤液。 The suspension was filtered and the filtrate was concentrated by Ceit e. 将残留物溶解在IOOmL CH2CL2中并用IX 25mL饱和NaHCO3水溶液洗涤。 The residue was dissolved in IOOmL CH2CL2 IX 25mL and washed with saturated aqueous NaHCO3. 将有机提取物在无水Na2SO4干燥、过滤并浓缩得到粘稠油。 The organic extract was dried over anhydrous Na2SO4, filtered, and concentrated to give a viscous oil. 将产物按照下述方式进行。 The product was carried out in the following manner. HPLC ：HP 1100 HPLC 色谱分离，Vydac 201TP10X250mm 的柱子，O.1OOmL 进样，2mL/min,在260nm 处检测，A =水(O.1 % HFBA)，B = MeCN(O.1 % HFBA)，梯度:10% 的B 洗涤2min，10-80%的B洗涤18分钟，用80-100%的B洗涤2min，用100%的B洗涤2mi n，停留时间15. 8mi η。  HPLC: HP 1100 HPLC chromatography, Vydac 201TP10X250mm column, O.1OOmL sample, 2mL / min, detection at 260nm, A = water (O.1% HFBA), B = MeCN (O.1% HFBA), gradient: 10% B wash 2min, washed with 18% B 10-80 min 80-100% B washed with 2min, washed with 100% of B 2mi n, the residence time 15. 8mi η. 7. 6Immole)、DIEA (2. 97g, 4. OOmL, 23. Ommole, 3. 02eq)、(2-漠甲基苯基）砸酸新戍基酷(6. 50g,23. Ommole, 3. 02eq)和BHT (5mg作为引发剂）在75mL CH2CL2中的溶液黑暗中搅拌28小时。 7. 6Immole), DIEA (2. 97g, 4. OOmL, 23. Ommole, 3. 02eq), (2- desert-methylphenyl) pentyl cool new drop acid (6. 50g, 23. Ommole, 3. 02eq) and BHT (5mg as initiator) in 75 mL CH2Cl2 was stirred in the dark for 28 hours was. 此时，将混合物用IX 25mL饱和NaHCO3水溶液洗涤。 At this time, the mixture was washed with saturated aqueous NaHCO3 IX 25mL. 将有机提取物在无水Na2SO4干燥、过滤并浓缩。 The organic extract was dried over anhydrous Na2SO4, filtered and concentrated. 向残留物中加入200mL醚，并将悬浮液搅拌18小时。 200mL ether was added to the residue, and the suspension was stirred for 18 hours. 将悬浮液过滤，并将残留物溶解在CH2CL2中，过滤并浓缩滤液。 The suspension was filtered and the residue was dissolved in CH2CL2, filtered and the filtrate concentrated. 将固体残留物中加入150mL醚并将悬浮液搅拌18小时。 The solid residue was added 150mL ether and the suspension was stirred for 18 hours. 此时，将悬浮液过滤得到1. 98g(33% )蓬松粉末，它在PBS(pH = 7. 4)中的最大溶解度为I毫摩尔。 At this time, the suspension was filtered to give 1. 98g (33%) fluffy powder, which in PBS (pH = 7. 4) The maximum solubility mmoles I.
 FAB MS :计算的C46H64B2N4O6 的[M]+ 为790，发现[M+1]+ 为791。  FAB MS: calculated [M] C46H64B2N4O6 + of 790, found [M + 1] + 791. HPLC ：HP 1100 HPLC 色谱分离，水5 X IOOmm NovaPak HR C18 的柱子，O. 050mL 进样，O. 75mL/min，在280nm 处检测，A =水(O. 1% HFBA)，B = MeCN(O. 1% HFBA)，梯度：10%的B洗涤2min，10-80%的B洗涤18分钟，用80-100%的B洗涤2mi n，用100%的B洗涤2min,停留时间13. 4min。  HPLC: HP 1100 HPLC chromatography, aqueous 5 X IOOmm NovaPak HR C18 column, O 050mL injection, O 75mL / min, detection at 280nm at, A = water (O. 1% HFBA), B.. = MeCN (O 1% HFBA. ), gradient: B 10% of the washed 2min, washed B 10-80% in 18 min, washed B 80-100% of 2mi n, B 100% washed with 2min, the residence time 13. 4min. 制备含有30% wt丙烯酰胺和O. 8% wt的N，N'-亚甲基二丙烯酰胺的乙二醇溶液的制备。 Preparation of  30% wt containing acrylamide and O. 8% wt of N, N'- ethylene glycol solution prepared methylene bis acrylamide. 将Ν-[3-(甲基丙烯酰胺基）丙基_3，4- 二羟基-9，10- 二氧-2-蒽磺酰胺（1. 5g，3. 38X I(T6Hiole)和α，α / -二[Ν_[2_(5，5_ 二甲基-[1，3，2] 二氧杂硼烷_2_ 基）苄基]-N-[3-(甲基丙烯酰胺基）丙基氨基]-1，4-二甲苯（28mg，3. 54 XI Ommole)与800 μ L乙二醇单体溶液和40 μ L过硫酸铵的5wt%水溶液混合。将该溶液连同显微镜载玻片和100微米不锈钢定距片构成的模板一起放置在氮气吹扫下的手套箱中。将N，N，N'，N'-四甲基乙二胺的水溶液加入到单体溶液中来加速聚合，将最终的组合物倒入玻璃模板中。将该模板放在氮气气氛下16小时,随后浸入PPS (pH = 7. 4)中，并分离显微镜载玻片得到一薄膜形式的水凝胶聚合物。将所得水凝胶薄膜用IOOmL含有ImM月桂基磷酸钠盐的PBS洗涤3天，其中溶液每天更换，随后用MeOH/PBS (20/80vol/vol, 3X IOOmL)洗涤，最后用PBS (pH = 7. 4, 3X IOOmL)洗涤。所得水凝胶聚 The Ν- [3- (methacrylamido) propyl -2- _3,4--dihydroxy-9,10-dioxo-anthracene-sulfonamide (1. 5g, 3. 38X I (T6Hiole) and α, α / - two [Ν_ [2_ (5,5_ dimethyl - [1,3,2] dioxaborolane _2_ yl) benzyl] -N- [3- (methacrylamido) propyl amino] -1,4-xylene (28mg, 3. 54 XI Ommole) with 800 μ L of ethylene glycol monomer solution and 40 μ L by mixing 5wt% aqueous solution of ammonium sulfate. the solution, together with a microscope slide, and placing a template 100 micron stainless steel spacer sheet formed together in a glove box under a nitrogen purge. the N, N, N ', N'- tetramethylethylenediamine aqueous solution was added to the monomer solution to accelerate polymerization, the final composition was poured into a glass templates. the templates in a nitrogen atmosphere for 16 hours, then immersed in PPS (pH = 7. 4) and is separated in the form of a microscope slide to obtain a hydrogel polymer film the resulting hydrogel thin film was washed with PBS IOOmL lauryl ImM sodium salt containing 3 days, the solution changed every day, followed by MeOH / PBS (20 / 80vol / vol, 3X IOOmL) washed, and finally with PBS (pH = 7. 4, 3X IOOmL) and washed. The resulting aqueous gel polymerization 物保存在含有O. 2wt%叠氮化钠和ImM EDTA 钠盐的PBS 中（IOmM PBS, pH = 7. 4)。 It was saved containing O. 2wt% sodium azide and sodium ImM EDTA in PBS (IOmM PBS, pH = 7. 4). 一式三份进行吸光率测试。 Triplicate test absorbance. 对于每个测试，将650nm处的吸光率用作空白对比,从A (450nm)和A(530nm)的值中减去A (650nm)。 For each test, the absorbance at 650nm is used as a blank comparison, subtracting A (650nm) from the value A (450nm) and A (530nm) in the. 图7表不,含有4mM Alizarin Red S单体（Alizarin Red:丙烯酸胺摩尔比为I ： 1000)和44mM 二硼酸单体的丙烯酰胺凝胶（30% )用或不用葡萄糖的吸收谱图。  FIG. 7 table does not contain a monomer 4mM Alizarin Red S (Alizarin Red: acrylamide molar ratio I: 1000) and acrylamide gels 44mM two acid monomer (30%) with or without glucose absorption spectrum Fig. 图8表示了葡萄糖对含有4mM AlizarinRed S单体和44mM 二硼酸单体的丙烯酰胺凝胶（30%)的丙烯酰胺的吸光率的影响。 Figure 8 shows the effect of glucose on absorbance of acrylamide gel containing an acrylamide monomer and 4mM AlizarinRed S 44mM two acid monomer (30%) of. 图9表示了乳酸钠对含有4mM Alizarin Red S单体和44mM二硼酸单体（硼酸单体：丙烯酰胺的摩尔比为1: 95)的丙烯酰胺凝胶（30% )的吸光率的作用。 9 shows lactate containing 4mM Alizarin Red S monomer and acid monomer effect 44mM two acrylamide gel (30%) of the absorbance (boric acid monomer: 95: molar ratio of acrylamide is 1). 指示剂的吸光率受存在的`葡萄糖的影响，但是基本上不受乳酸盐的存在的影响。 Absorbance indicator affected by the presence of glucose ', but substantially unaffected by the presence of lactate. 1. 一种用于检测水环境中分析物存在或浓度的指示剂大分子，所述大分子含有由下述组分发生共聚而得到的共聚物：a) 一种或多种指示剂组分单体，该单体单独不足以充分溶解在水中使之应用于用于检测所述分析物存在或浓度的水环境，且该单体选自镧系元素螯合物和N-(邻硼苄基）氨基甲基蒽衍生物，其中所述镧系元素螯合物的螯合剂包含1，4，7，10-四氮杂环十二烷；和b) 一种或多种亲水性单体；结果使得大分子能够检测水环境中所述分析物的存在或浓度，其中所述分析物是葡萄糖。 A copolymer aqueous environment for detection of analyte presence or concentration of an indicator macromolecule, the macromolecule containing the following components generated by obtained by copolymerizing: a) one or more indicator components monomer, the monomer alone is not sufficient to make it sufficiently soluble applied for detecting the presence or concentration of analyte in the aqueous environment of water, and the monomer is selected from a lanthanide chelate and N- (o-benzyl boron yl) aminomethyl anthracene derivative, wherein the lanthanide chelate of 1,4,7,10-tetraaza-chelating agent comprises cyclododecane; and b) one or more hydrophilic single thereof; with the result that the water molecules can be detected in the environment analyzed for the presence or concentration of the analyte, wherein said analyte is glucose. 2.根据权利要求1的指示剂大分子，其中该大分子能够通过光学变化来检测。 Indicator macromolecules according to claim 1, wherein the macromolecule can be detected by optical change. 3.根据权利要求1的指示剂大分子，其中指示剂组分单体选自下述化合物：9-[[N-甲基丙烯酰氨基丙基-N-(邻硼苄基）氨基]甲基]蒽；9-[N-[2-(5，5-二甲基-[1，3，2] 二氧杂硼烷_2_基）苄基]-N-[3-(甲基丙烯酰胺基）丙基氨基]甲基]-10-[N-[2-(5，5-二甲基-[1，3，2] 二氧杂硼烷_2_基）苄基-N_[2_(2-羟基乙氧基）-乙基氨基]甲基]蒽；9-[N-(2-硼苄基）-N-[3-(甲基丙烯酰胺基）丙基氨基]甲基]-10-[N-(2-硼苄基）-N-[2-(2-羟基乙氧基）-乙基氨基]甲基]蒽；9，10- 二[N-[2-(5，5- 二甲基-[1，3, 2] 二氧杂硼烧~2~基）节基]-N_[3_(甲基丙烯酰胺基）丙基氨基]甲基蒽；9，10-二[N-(2-硼苄基）-N-[3-(甲基丙烯酰胺基）-丙基氨基]甲基]蒽；9-[N-[2-(5，5-二甲基-[1，3，2] 二氧杂硼烷_2_基）苄基]-N-[2-(2-甲基丙烯酰氧基乙氧基）乙基氨基]甲基]-10-[N-[2_(5, 5-二甲基-[1，3，2] 二氧杂硼烧-2-基）节基]-N-[2-(2-羟基乙氧基 Indicator macromolecules according to claim 1, wherein the monomeric indicator component is selected from the following compounds: 9 - [[N- methacryl amidopropyl -N- (o-boron-benzyl) amino] methyl yl] anthracene; 9- [N- [2- (5,5- dimethyl - [1,3,2] dioxaborolane _2_ yl) benzyl] -N- [3- (methyl acrylamido-yl) propylamino] methyl] -10- [N- [2- (5,5- dimethyl - [1,3,2] dioxaborolane _2_ yl) benzyl -N_ [2_ (2-hydroxyethoxy) - ethylamino] methyl] anthracene; 9- [N- (2- boron-benzyl) -N- [3- (methacrylamido) propylamino] methyl yl] -10- [N- (2- boron-benzyl) -N- [2- (2- hydroxyethoxy) - ethylamino] methyl] anthracene; 9,10-bis [N- [2- (5,5-dimethyl - [1,3, 2] dioxaborolan ~ 2 ~ yl burn) section yl] -N_ [3_ (methacrylamido) propylamino] methylanthracene; 9, two 10- [N- (2- boron-benzyl) -N- [3- (methacrylamido) - propylamino] methyl] anthracene; 9- [N- [2- (5,5- two methyl - [1,3,2] dioxaborolane _2_ yl) benzyl] -N- [2- (2- methacryloyloxy) ethyl amino] methyl] - 10- [N- [2_ (5, 5- dimethyl - [l, 3,2] dioxaborolan-2-yl burn) section yl] -N- [2- (2- hydroxyethoxy -乙基氨基]甲基]蒽；9-[N-(2-硼苄基）-N-[2-(2-甲基丙烯酰氧基乙氧基）乙基氨基]甲基]-10-[N-(2-硼苄基）]-N-[2-(2-羟基乙氧基）-乙基氨基]甲基]蒽；9，10-二[N-[2-(5，5-二甲基-[1，3，2] 二氧杂硼烷_2_ 基）苄基]-N-[2-(2-甲基丙烯酰氧基乙氧基）乙基氨基]甲基]蒽；9，10-二[N-(2-硼苄基）-N-[2-(2-甲基丙烯酰氧基乙氧基）乙基氨基]甲基]蒽；以及它们的盐或衍生物。 - ethylamino] methyl] anthracene; 9- [N- (2- boron-benzyl) -N- [2- (2- methacryloyloxy ethoxy) ethylamino] methyl] -10 - [N- (2- boron-benzyl)] - N- [2- (2- hydroxyethoxy) - ethylamino] methyl] anthracene; 9,10-bis [N- [2- (5, 5-methyl - [1,3,2] dioxaborolane _2_ yl) benzyl] -N- [2- (2- methacryloyloxy) ethyl amino] methyl ] anthracene; 9,10-bis [N- (2- boron-benzyl) -N- [2- (2- methacryloyloxy) ethyl amino] methyl] anthracene; and salts thereof or derivative thereof. 4.根据权利要求1的指示剂大分子，其中亲水性单体包括[3-(甲基丙烯酰氧基氨基）_丙基]三甲基氯化铵。 Indicator macromolecules according to claim 1, wherein the hydrophilic monomer comprises [3- (methacryloyloxy amino) _ propyl] trimethyl ammonium chloride. 5.根据权利要求1的指示剂大分子，其中亲水性单体与指示剂组分单体的摩尔比为2:1-1000:1。 Indicator macromolecules according to claim 1, wherein the molar ratio of the hydrophilic monomer with the indicator component monomer is 2: 1 to 1000: 1. 6.根据权利要求5的指示剂大分子，其中亲水性单体与指示剂组分单体的摩尔比为5:1-50:1。 Indicator macromolecules according to claim 5, wherein the molar ratio of the hydrophilic monomer with the indicator component monomer is 5: 1-50: 1. 7.根据权利要求6的指示剂大分子，其中亲水性单体与指示剂组分单体的摩尔比为5:1。 7. The indicator macromolecules according to claim 6, wherein the molar ratio of the hydrophilic monomer in the monomer component with the indicator is 5: 1. 8.根据权利要求1的指示剂大分子，其中：i)亲水性单体与指示剂组分单体的摩尔比为2:1-15:1，ii)指示剂组分单体含有N-(邻硼苄基）氨基甲基蒽衍生物，iii)亲水性单体含有[3-(甲基丙烯酰氧基氨基）丙基]三甲基氯化铵，以及iv)大分子具有激发物作用。 Indicator macromolecules according to claim 1, wherein: i) the molar ratio of the hydrophilic monomer with the indicator component monomer is 2: 1-15: 1, ii) a monomer component containing an indicator N - (o boron benzyl) aminomethyl anthracene derivative, III) containing hydrophilic monomers [3- (methacryloyloxy) propyl] trimethylammonium chloride, and iv) macromolecules having excimer role. 9. 一种用于制备指示剂大分子的方法，所述指示剂大分子是用于检测水环境中分析物的存在或浓度，所述方法包括聚合下述组分：a) 一种或多种指示剂组分单体，该单体单独不足以充分溶解在水中使之应用于用于检测所述分析物存在或浓度的水环境，且单体选自镧系元素螯合物和N-(邻硼苄基）氨基甲基蒽衍生物，其中所述镧系元素螯合物的螯合剂包含1，4，7，10-四氮杂环十二烷；和b) 一种或多种亲水性单体；结果使得大分子能够检测水环境中所述分析物的存在或浓度，其中所述分析物是葡萄糖。 A method for preparing macromolecule indicator, the indicator is a macromolecule for detecting the presence or concentration of an analyte in a water environment, said method comprising polymerizing the following components: a) one or more species indicator component monomers, the monomer alone is not sufficient to make it sufficiently soluble applied for detecting the presence or concentration of analyte in the aqueous environment of water and monomer is selected from a lanthanide chelate and N- (o boron benzyl) aminomethyl anthracene derivative, wherein the lanthanide chelate of 1,4,7,10-tetraaza-chelating agent comprises cyclododecane; and b) one or more hydrophilic monomer; molecules can be detected with the result that the water environment analyzed for the presence or concentration of the analyte, wherein said analyte is glucose. 10.根据权利要求9的方法，其中该大分子能够通过光学变化来检测。 10. The method of claim 9, wherein the macromolecule can be detected by optical change. 11.根据权利要求9的方法，其中指示剂组分单体选自下述化合物：9-[[N-甲基丙烯酰氨基丙基-N-(邻硼苄基）氨基]甲基]蒽；9-[N-[2-(5，5-二甲基-[1，3，2] 二氧杂硼烷_2_基）苄基]-N-[3-(甲基丙烯酰胺基）丙基氨基]甲基]-10-[N-[2-(5，5-二甲基-[1，3，2] 二氧杂硼烷_2_基）苄基-N_[2_(2-羟基乙氧基）-乙基氨基]甲基]蒽；9-[N-(2-硼苄基）-N-[3-(甲基丙烯酰胺基）丙基氨基]甲基]-10-[N-(2-硼苄基）-N-[2-(2-羟基乙氧基）-乙基氨基]甲基]蒽；9，10- 二[N-[2-(5，5- 二甲基-[1，3, 2] 二氧杂硼烧~2~基）节基]-N_[3_(甲基丙烯酰胺基）丙基氨基]甲基]蒽；9，10-二[N-(2-硼苄基）-N-[3-(甲基丙烯酰胺基）-丙基氨基]甲基]蒽；9-[N-[2-(5，5-二甲基-[1，3，2] 二氧杂硼烷_2_基）苄基]-N-[2-(2-甲基丙烯酰氧基乙氧基）乙基氨基]甲基]-10-[N-[2_(5, 5-二甲基-[1，3，2] 二氧杂硼烧-2-基）节基]-N-[2-(2-羟基乙氧基）-乙基 11. The method according to claim 9, wherein the indicator component monomer is selected from the following compounds: 9 - [[N- methacryl amidopropyl -N- (o-boron-benzyl) amino] methyl] anthracene ; 9- [N- [2- (5,5- dimethyl - [1,3,2] dioxaborolane _2_ yl) benzyl] -N- [3- (methacrylamido ) propylamino] methyl] -10- [N- [2- (5,5- dimethyl - [1,3,2] dioxaborolane _2_ yl) benzyl -N_ [2_ ( 2-hydroxyethoxy) - ethylamino] methyl] anthracene; 9- [N- (2- boron-benzyl) -N- [3- (methacrylamido) propylamino] methyl] - 10- [N- (2- boron-benzyl) -N- [2- (2- hydroxyethoxy) - ethylamino] methyl] anthracene; 9,10-bis [N- [2- (5, 5-methyl - [1,3, 2] dioxaborolan ~ 2 ~ yl burn) section yl] -N_ [3_ (methacrylamido) propylamino] methyl] anthracene; 9,10 two [N- (2- boron-benzyl) -N- [3- (methacrylamido) - propylamino] methyl] anthracene; 9- [N- [2- (5,5- dimethyl - [1,3,2] dioxaborolane _2_ yl) benzyl] -N- [2- (2- methacryloyloxy ethoxy) ethylamino] methyl] -10- [N- [2_ (5, 5- dimethyl - [l, 3,2] dioxaborolan-2-yl burn) section yl] -N- [2- (2- hydroxyethoxy) - b base 基]甲基]蒽；9-[N-(2-硼苄基）-N-[2-(2-甲基丙烯酰氧基乙氧基）乙基氨基]甲基]-10-[N-(2-硼苄基）]-N-[2-(2-羟基乙氧基）-乙基氨基]甲基]蒽；9，10-二[N-[2-(5，5-二甲基-[1，3，2] 二氧杂硼烷_2_ 基）苄基]-N-[2-(2-甲基丙烯酰氧基乙氧基）乙基氨基]甲基]蒽；9，10-二[N-(2-硼苄基）-N-[2-(2-甲基丙烯酰氧基乙氧基）乙基氨基]甲基]蒽；以及它们的盐或衍生物。 Yl] methyl] anthracene; 9- [N- (2- boron-benzyl) -N- [2- (2- methacryloyloxy ethoxy) ethylamino] methyl] -10- [N - (2-benzyl boron)] - N-[2- (2-hydroxyethoxy) - ethylamino] methyl] anthracene; 9,10-bis [N- [2- (5,5- two methyl - [1,3,2] dioxaborolane _2_ yl) benzyl] -N- [2- (2- methacryloyloxy) ethyl amino] methyl] anthracene; 9,10-bis [N- (2- boron-benzyl) -N- [2- (2- methacryloyloxy) ethyl amino] methyl] anthracene; and salts or derivatives thereof . 12.根据权利要求9的方法，其中亲水性单体包括[3-(甲基丙烯酰氧基氨基）_丙基]三甲基氯化铵。 12. The method according to claim 9, wherein the hydrophilic monomer comprises [3- (methacryloyloxy amino) _ propyl] trimethyl ammonium chloride. 13.根据权利要求9的方法，其中亲水性单体与指示剂组分单体的摩尔比为2:1-1000:1。 13. The method according to claim 9, wherein the molar ratio of the hydrophilic monomer with the indicator component monomer is 2: 1 to 1000: 1. 14.根据权利要求13的方法，其中亲水性单体与指示剂组分单体的摩尔比为5:1-50:1。 14. The method according to claim 13, wherein the molar ratio of the hydrophilic monomer with the indicator component monomer is 5: 1-50: 1. 15.根据权利要求14的方法，其中亲水性单体与指示剂组分单体的摩尔比为5:1。 15. A method according to claim 14, wherein the molar ratio of the hydrophilic monomer in the monomer component with the indicator is 5: 1. 16.根据权利要求9的方法，其中：i)亲水性单体与指示剂组分单体的摩尔比为2:1-15:1，ϋ)指示剂组分单体含有N-(邻硼苄基）氨基甲基蒽衍生物，iii)亲水性单体含有[3-(甲基丙烯酰氧基氨基）丙基]三甲基氯化铵，以及iv)大分子具有激发物作用。 16. The method according to claim 9, wherein: i) the molar ratio of the hydrophilic monomer with the indicator component monomer is 2: 1-15: 1, ϋ) indicator component monomers containing N- (o- boron-benzyl) aminomethyl anthracene derivative, III) containing hydrophilic monomers [3- (methacryloyloxy) propyl] trimethylammonium chloride, and iv) macromolecular substance having an excitation effect . 17. 一种用于检测具有水环境的样品中分析物存在或浓度的方法，所述方法包括：a)将样品暴露于指示剂大分子中，所述大分子含有由下述组分发生共聚而得到的共聚物i) 一种或多种指示剂组分单体，该单体单独不足以充分溶解在水中使之应用于用于检测所述分析物存在或浓度的水环境，且单体选自镧系元素螯合物和N-(邻硼苄基）氨基甲基蒽衍生物，其中所述镧系元素螯合物的螯合剂包含1，4，7，10-四氮杂环十二烷；和ϋ) 一种或多种亲水性单体；结果使得所得大分子能够检测所述分析物在水环境中的存在或浓度，并且当所述大分子暴露于所述分析物中时，指示剂大分子具有依赖浓度方式变化的可检测出的特性，其中所述分析物是葡萄糖；和b)测试所述可检测出的特性的任何变化，由此确定所述分析物在所述样品中的存在或浓度。 17. A method of detecting a sample having a water environment for the presence or concentration of an analyte, said method comprising: a) exposing the sample to the indicator macromolecule, the macromolecule containing the following components generated by copolymerizing the copolymer i) one or more indicator components obtained from a monomer, the monomer alone is not sufficient to make it sufficiently soluble applied for detecting the presence or concentration of analyte in the aqueous environment of water and the monomer selected from the lanthanide chelate and N- (o-boron-benzyl) aminomethyl anthracene derivative, wherein the lanthanide chelate of 1,4,7,10-tetraazacyclododecane-chelating agent comprises ten azetidin dioxane; and ϋ) one or more hydrophilic monomers; with the result that the resulting molecules capable of detecting the presence or concentration of said analyte in an aqueous environment, and when the macromolecule is exposed to the analyte when the indicator macromolecules having a concentration-dependent manner detectable change in a characteristic, wherein the analyte is glucose; and any change in testing said detectable characteristic B), thereby determining the analyte in the said presence or concentration in the sample. 18.根据权利要求17的方法，其中可检测得出的特性是光学变化。 18. The method of claim 17, wherein the detectable change in the optical characteristic is obtained. 19.根据权利要求17的方法，其中指示剂组分单体选自下述化合物：9-[[N-甲基丙烯酰氨基丙基-N-(邻硼苄基）氨基]甲基]蒽；9-[N-[2-(5，5-二甲基-[1，3，2] 二氧杂硼烷_2_基）苄基]-N-[3-(甲基丙烯酰胺基）丙基氨基]甲基]-10-[N-[2-(5，5-二甲基-[1，3，2] 二氧杂硼烷_2_基）苄基-N_[2_(2-羟基乙氧基）-乙基氨基]甲基]蒽；9-[N-(2-硼苄基）-N-[3-(甲基丙烯酰胺基）丙基氨基]甲基]-10-[N-(2-硼苄基）-N-[2-(2-羟基乙氧基）-乙基氨基]甲基]蒽；9，10- 二[N-[2-(5，5- 二甲基-[1，3, 2] 二氧杂硼烧~2~基）节基]-N_[3_(甲基丙烯酰胺基）丙基氨基]甲基]蒽；9，10- 二[N- (2-硼苄基）-N- [3-(甲基丙烯酰胺基）-丙基氨基]甲基蒽；9-[N-[2-(5，5-二甲基-[1，3，2] 二氧杂硼烷_2_基）苄基]-N-[2-(2-甲基丙烯酰氧基乙氧基）乙基氨基]甲基]-10-[N_[2-(5，5-二甲基-[1，3，2] 二氧杂硼烧-2-基）节基]-N-[2-(2-羟基乙氧基）-乙 19. The method according to claim 17, wherein the indicator component monomer is selected from the following compounds: 9 - [[N- methacryl amidopropyl -N- (o-boron-benzyl) amino] methyl] anthracene ; 9- [N- [2- (5,5- dimethyl - [1,3,2] dioxaborolane _2_ yl) benzyl] -N- [3- (methacrylamido ) propylamino] methyl] -10- [N- [2- (5,5- dimethyl - [1,3,2] dioxaborolane _2_ yl) benzyl -N_ [2_ ( 2-hydroxyethoxy) - ethylamino] methyl] anthracene; 9- [N- (2- boron-benzyl) -N- [3- (methacrylamido) propylamino] methyl] - 10- [N- (2- boron-benzyl) -N- [2- (2- hydroxyethoxy) - ethylamino] methyl] anthracene; 9,10-bis [N- [2- (5, 5-methyl - [1,3, 2] dioxaborolan ~ 2 ~ yl burn) section yl] -N_ [3_ (methacrylamido) propylamino] methyl] anthracene; 9,10 two [N- (2- boron-benzyl) -N- [3- (methacrylamido) - propylamino] methylanthracene; 9- [N- [2- (5,5- dimethyl - [1,3,2] dioxaborolane _2_ yl) benzyl] -N- [2- (2- methacryloyloxy ethoxy) ethylamino] methyl] -10- [ N_ [2- (5,5- dimethyl - [l, 3,2] dioxaborolan-2-yl burn) section yl] -N- [2- (2- hydroxyethoxy) - b 基氨基]甲基]蒽；9-[N-(2-硼苄基）-N-[2-(2-甲基丙烯酰氧基乙氧基）乙基氨基]甲基]-10-[N-(2-硼苄基）]-N-[2-(2-羟基乙氧基）-乙基氨基]甲基]蒽；9，10-二[N-[2-(5，5-二甲基-[1，3，2] 二氧杂硼烷_2_ 基）苄基]-N-[2-(2-甲基丙烯酰氧基乙氧基）乙基氨基]甲基]蒽；9，10-二[N-(2-硼苄基）-N-[2-(2-甲基丙烯酰氧基乙氧基）乙基氨基]甲基]蒽；以及它们的盐或衍生物。 Amino] methyl] anthracene; 9- [N- (2- boron-benzyl) -N- [2- (2- methacryloyloxy ethoxy) ethylamino] methyl] -10- [ N- (2- boron-benzyl)] - N- [2- (2- hydroxyethoxy) - ethylamino] methyl] anthracene; 9,10-bis [N- [2- (5,5- dimethyl - [1,3,2] dioxaborolane _2_ yl) benzyl] -N- [2- (2- methacryloyloxy) ethyl amino] methyl] anthracene ; 9,10-bis [N- (2- boron-benzyl) -N- [2- (2- methacryloyloxy) ethyl amino] methyl] anthracene; and salts or derivatives thereof thereof. 20.根据权利要求17的方法，其中亲水性单体包括[3-(甲基丙烯酰氧基氨基）_丙基]三甲基氯化铵。 20. The method according to claim 17, wherein the hydrophilic monomer comprises [3- (methacryloyloxy amino) _ propyl] trimethyl ammonium chloride. 21.根据权利要求17的方法，其中亲水性单体与指示剂组分单体的摩尔比为`2:1-1000:1。 21. The method according to claim 17, wherein the molar ratio of the hydrophilic monomer with the indicator component monomers `2: 1 to 1000: 1. 22.根据权利要求21的方法，其中亲水性单体与指示剂组分单体的摩尔比为5:1-50:1。 22. The method according to claim 21, wherein the molar ratio of the hydrophilic monomer with the indicator component monomer is 5: 1-50: 1. 23.根据权利要求22的方法，其中亲水性单体与指示剂组分单体的摩尔比为5:1。 23. The method according to claim 22, wherein the molar ratio of the hydrophilic monomer in the monomer component with the indicator is 5: 1. 24.根据权利要求17的方法，其中：i)亲水性单体与指示剂组分单体的摩尔比为2:1-15:1，ϋ)指示剂组分单体含有N-(邻硼苄基）氨基甲基蒽衍生物，iii)亲水性单体含有[3-(甲基丙烯酰氧基氨基）丙基]三甲基氯化铵，以及iv)大分子具有激发物作用。 24. The method of claim 17, wherein: i) the molar ratio of the hydrophilic monomer with the indicator component monomer is 2: 1-15: 1, ϋ) indicator component monomers containing N- (o- boron-benzyl) aminomethyl anthracene derivative, III) containing hydrophilic monomers [3- (methacryloyloxy) propyl] trimethylammonium chloride, and iv) macromolecular substance having an excitation effect . 25.根据权利要求24的方法，其中所述大分子既用作指示剂又用作参照物。 25. The method according to claim 24, wherein both the macromolecule and used as an indicator used as a reference. 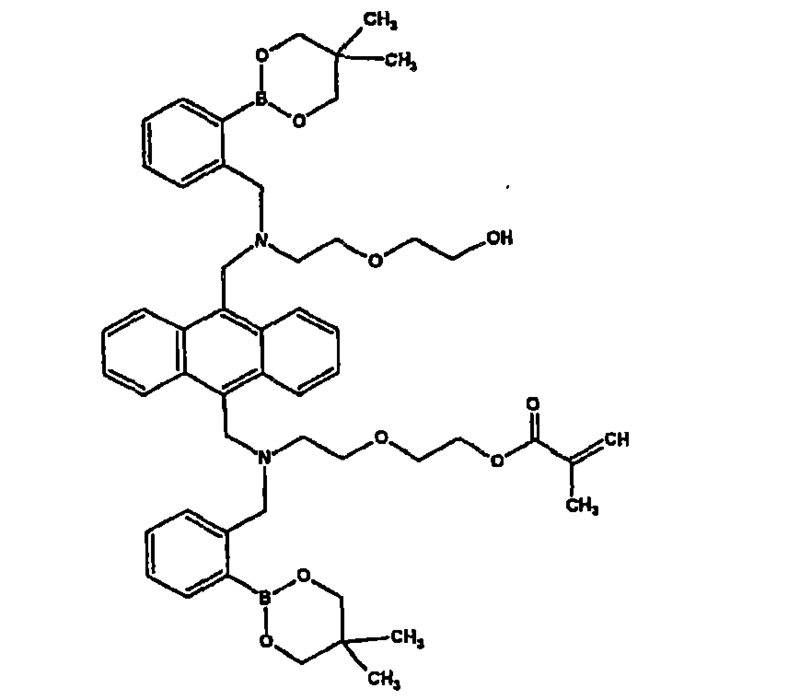 ITMI20021921A1 (en) * 2002-09-10 2004-03-11 Indena Spa Functionalization of position 14 of the taxane and synthesis of new anticancer derivatives nuclei. Free format text: CORRECT: APPLICANT; FROM: SENSORS FOR MEDICINE AND SCIENCE, INC. TO: SENSOR TECHNOLOGY CO., LTD.